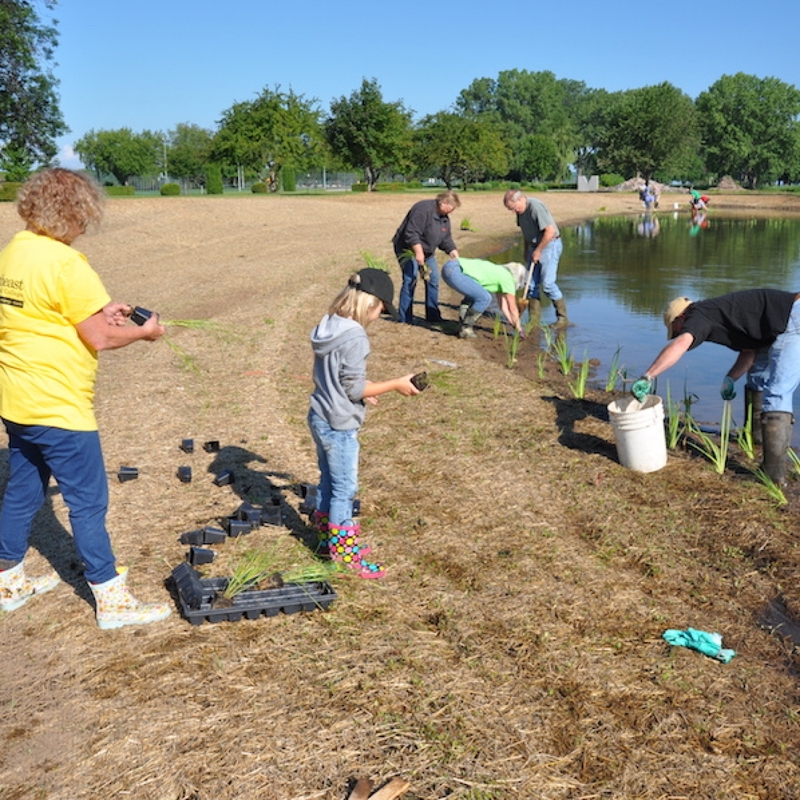 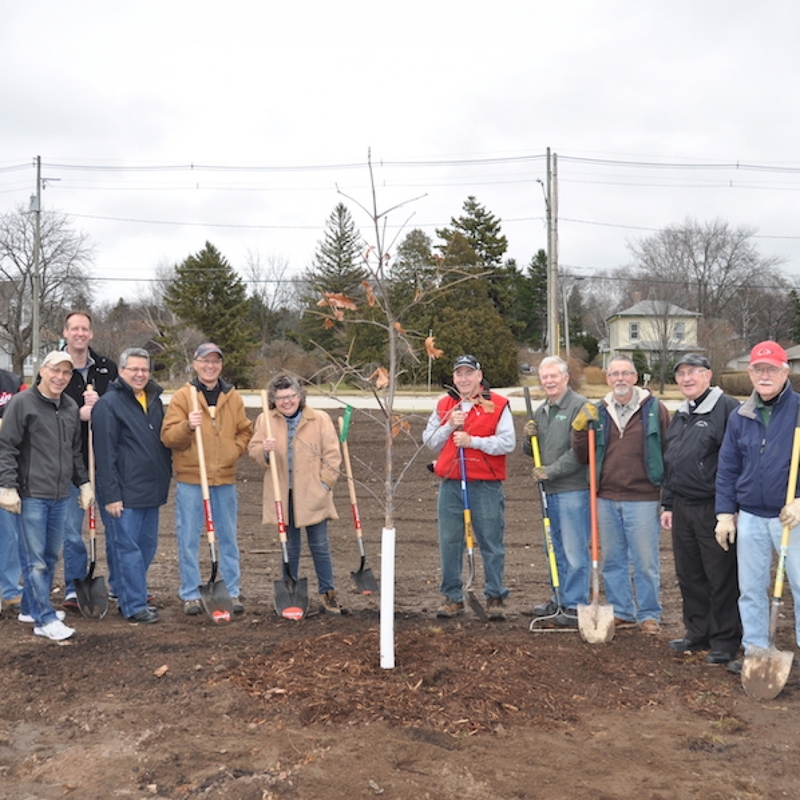 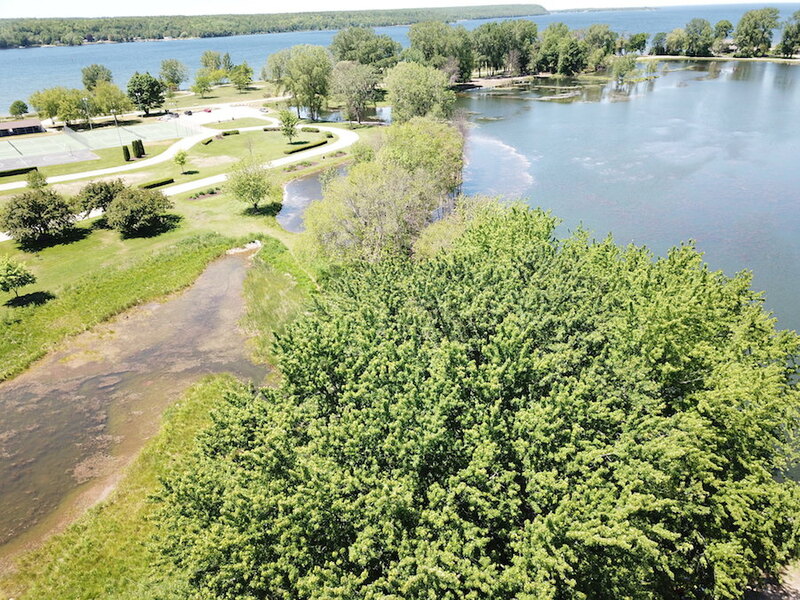 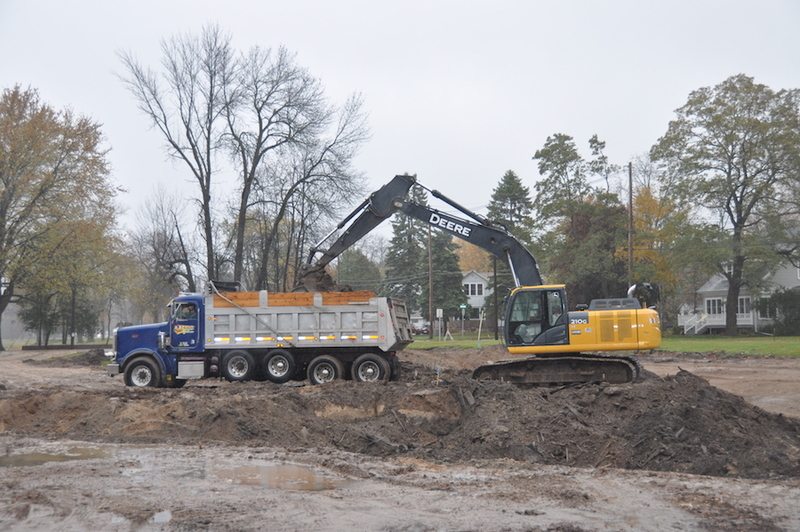 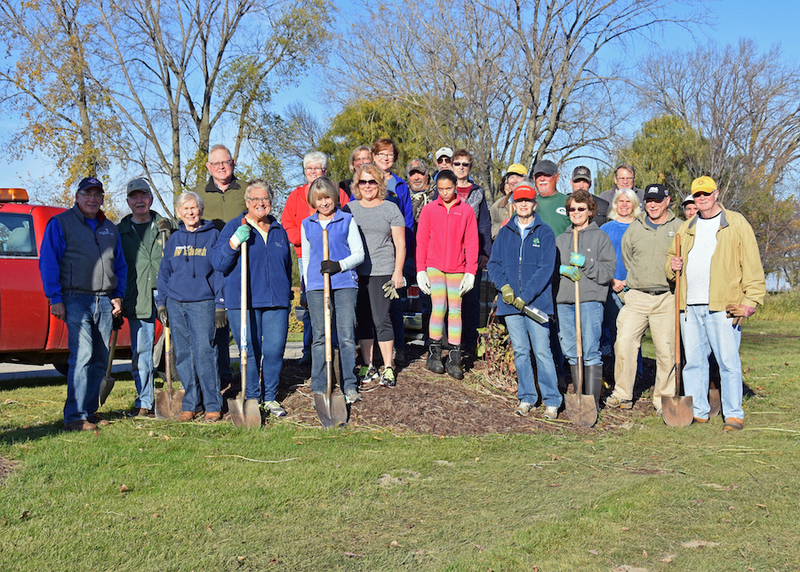 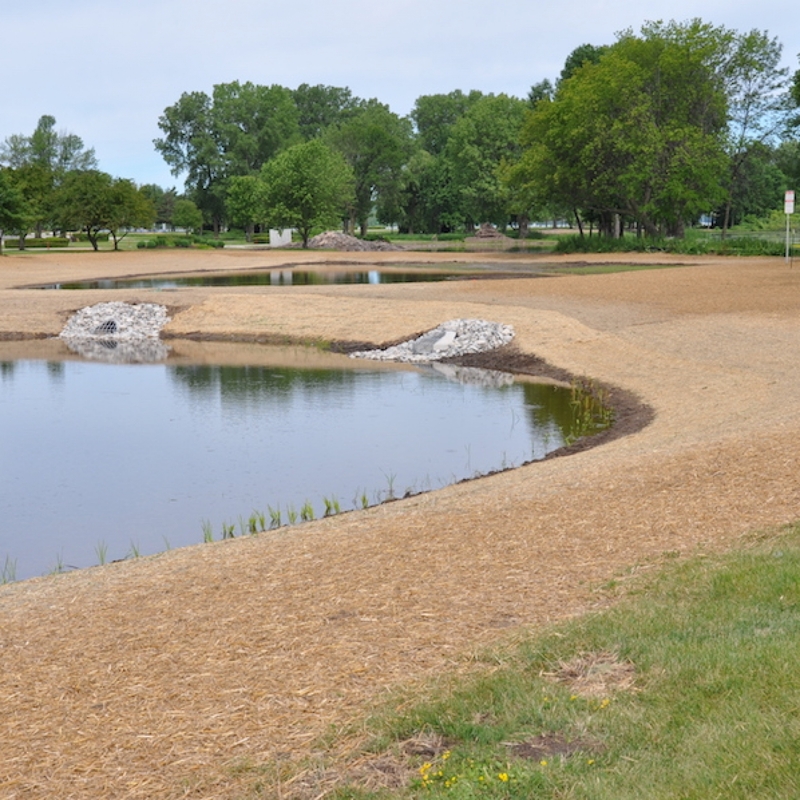 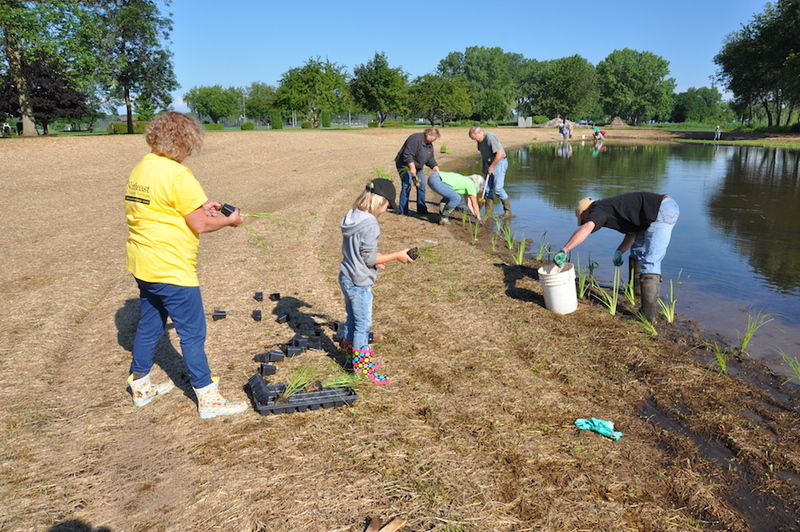 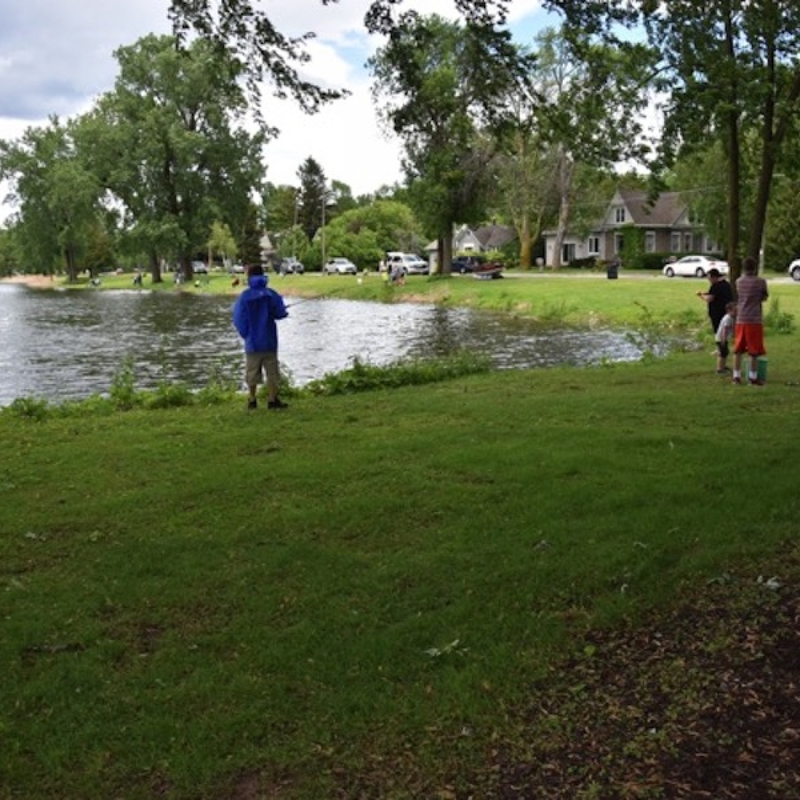 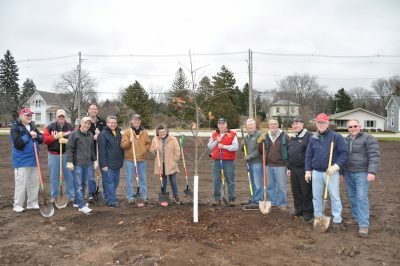 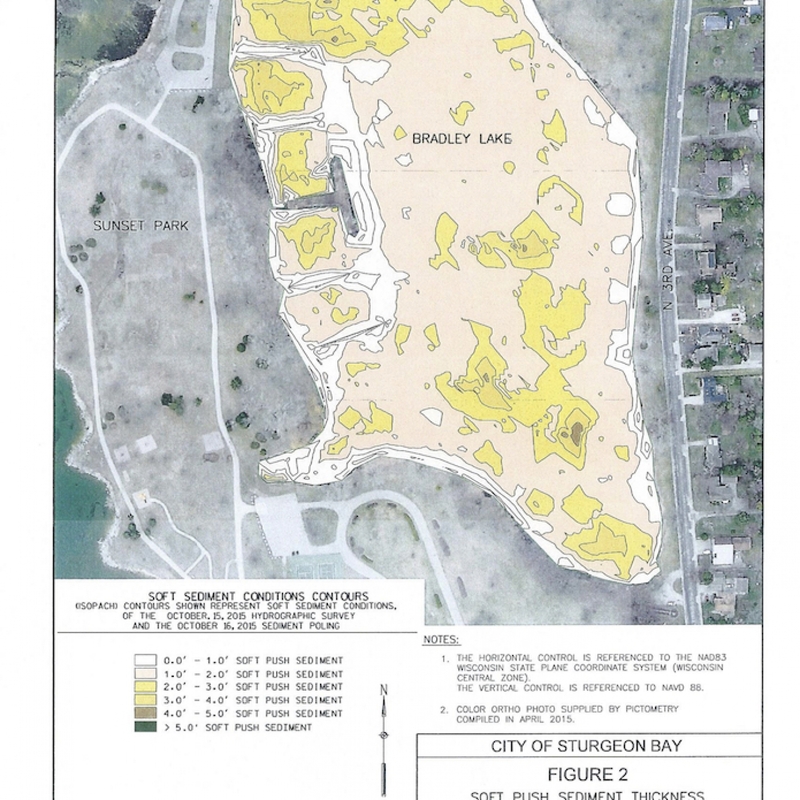 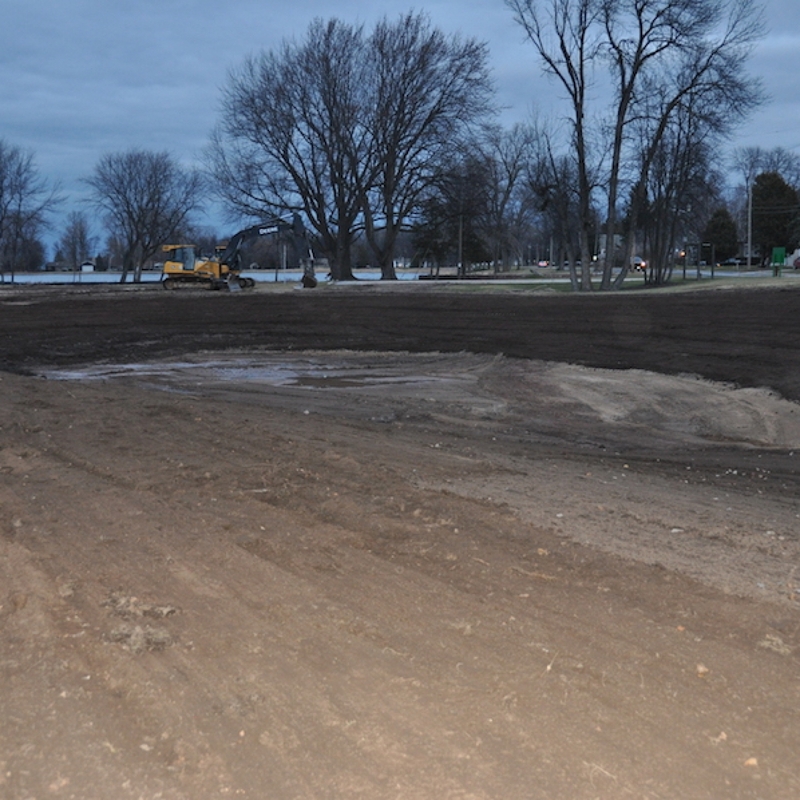 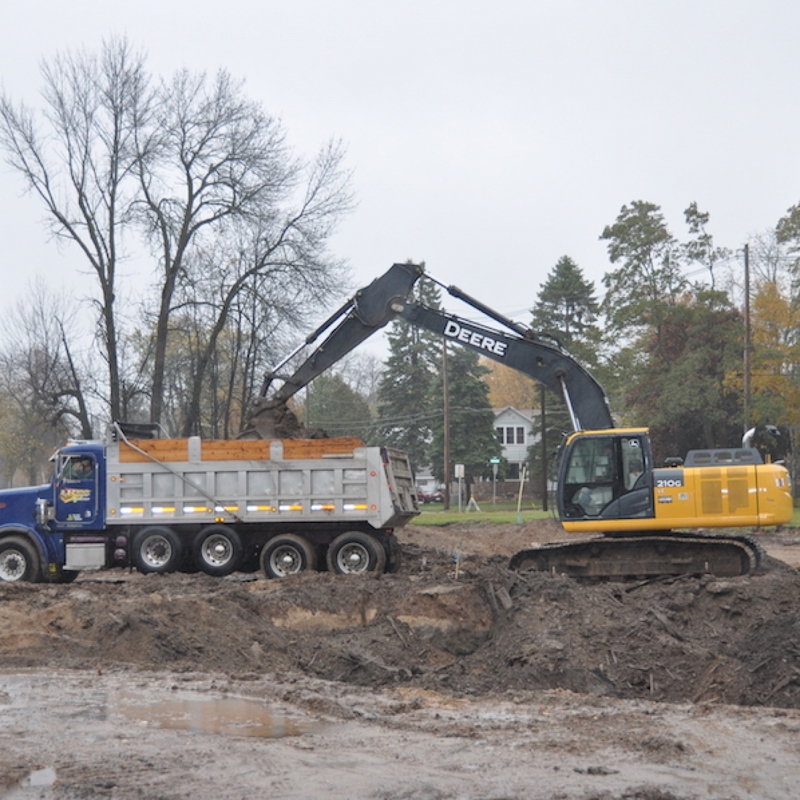 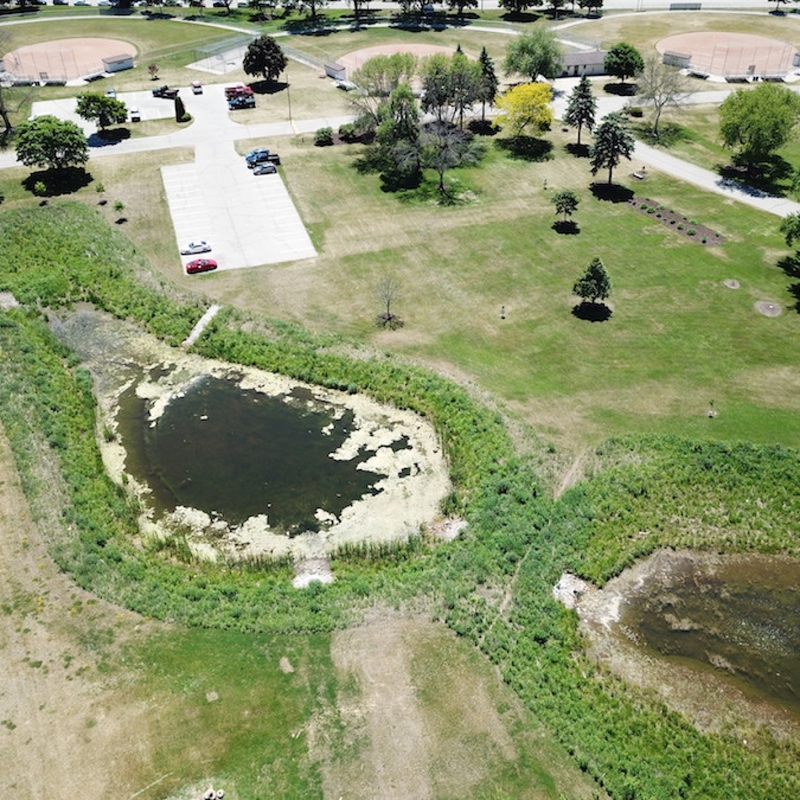 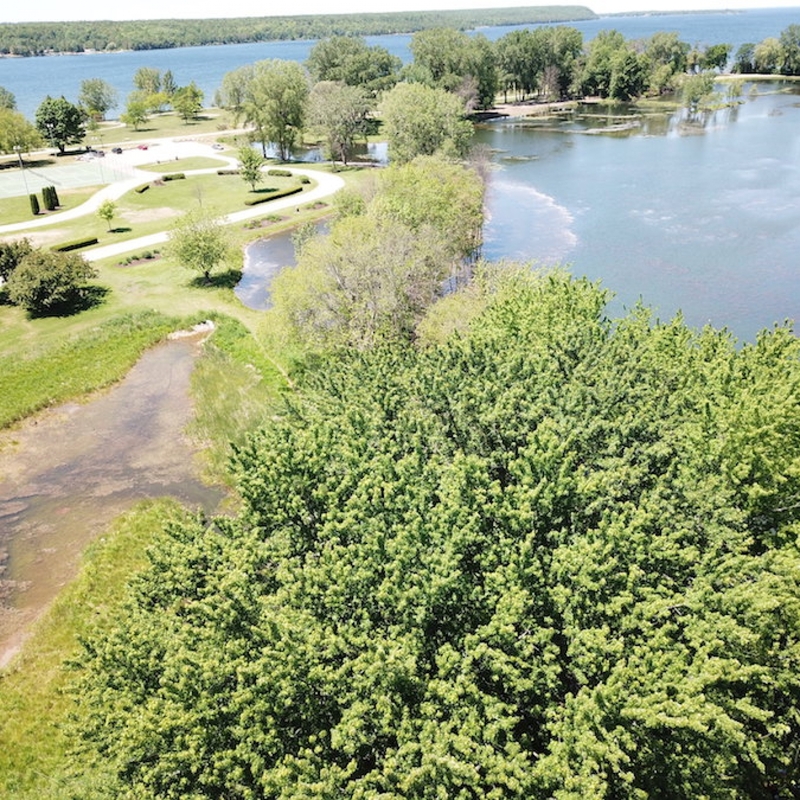 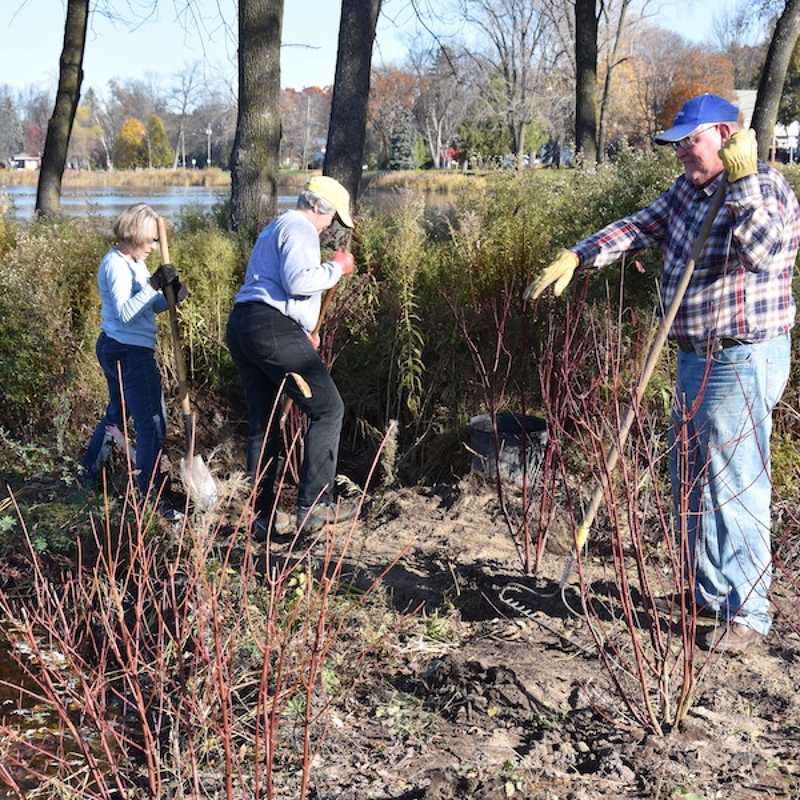 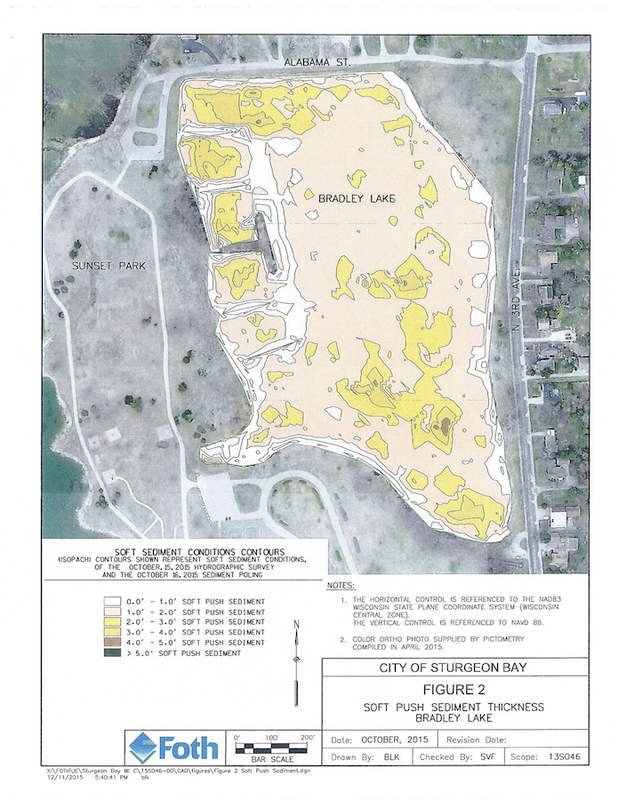 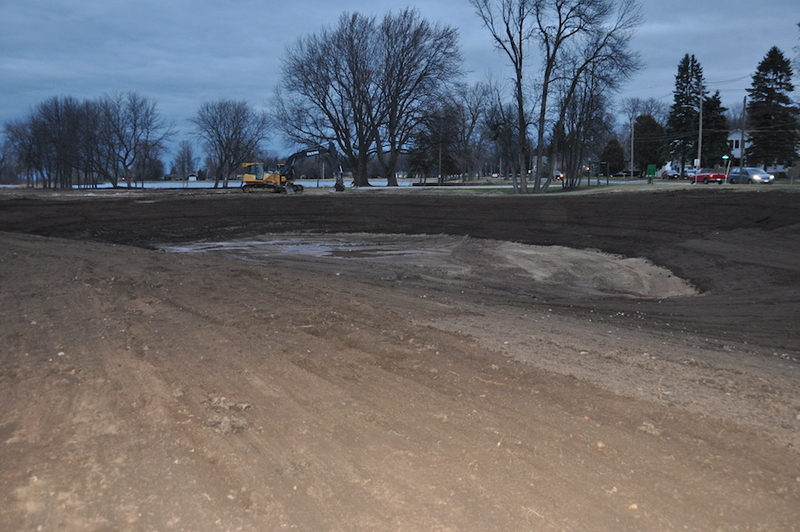 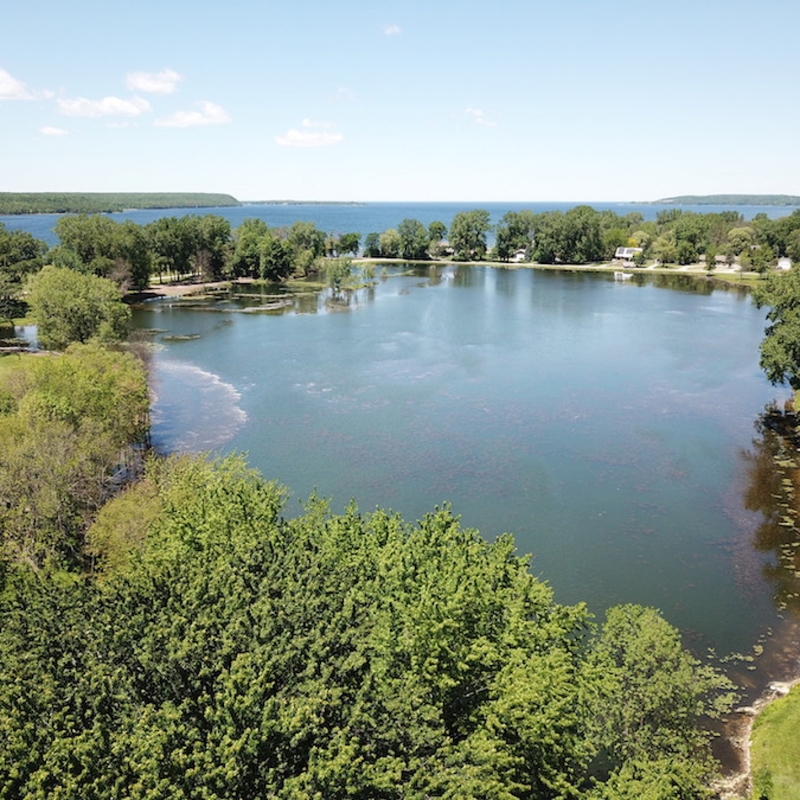 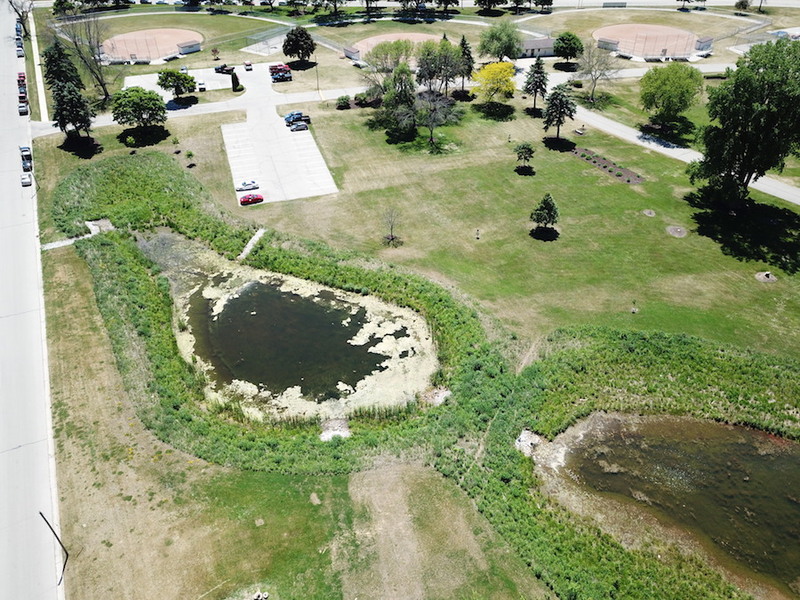 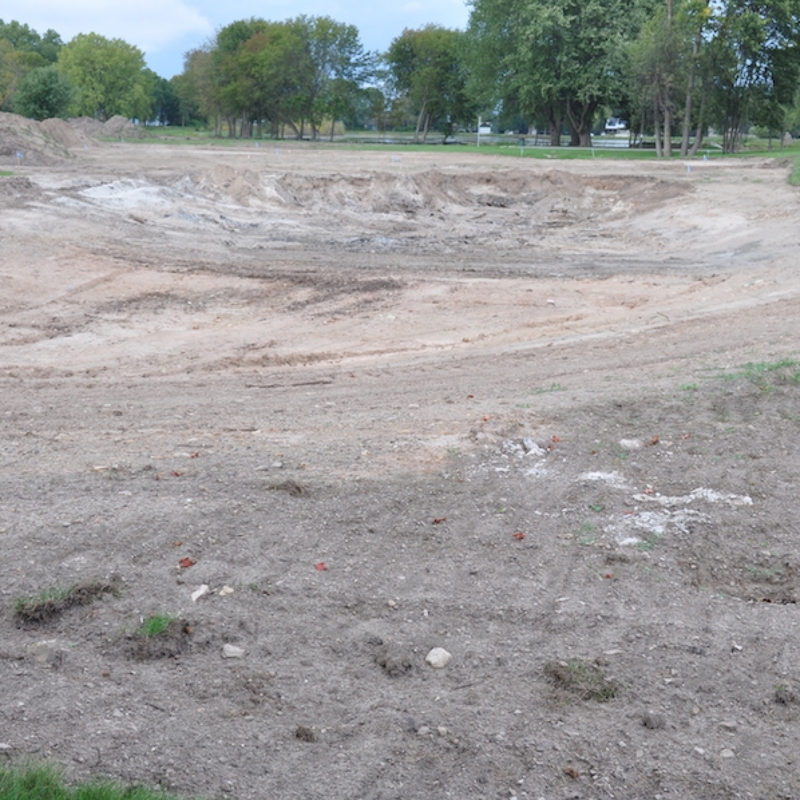 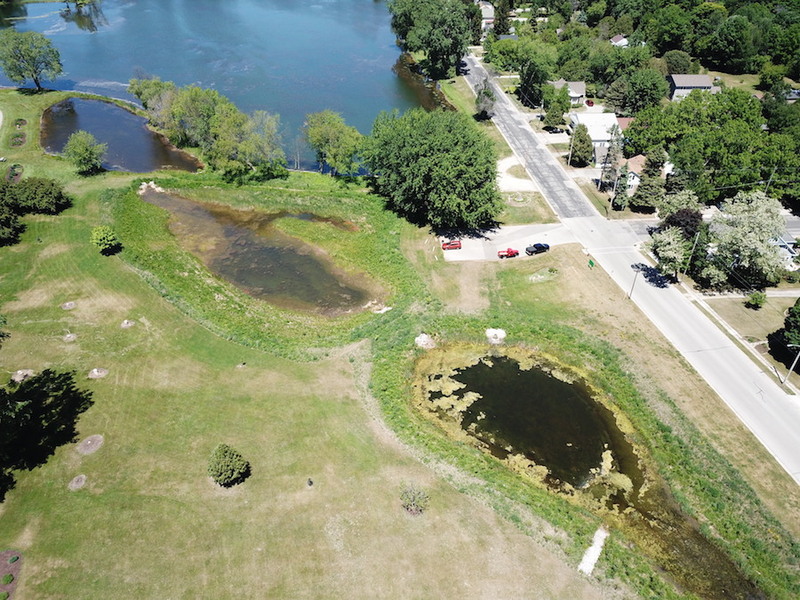 The Restoration of Little Lake has been a cooperative effort by the Rotary Club of Sturgeon Bay, the City of Sturgeon Bay, and the Door County Community Foundation. 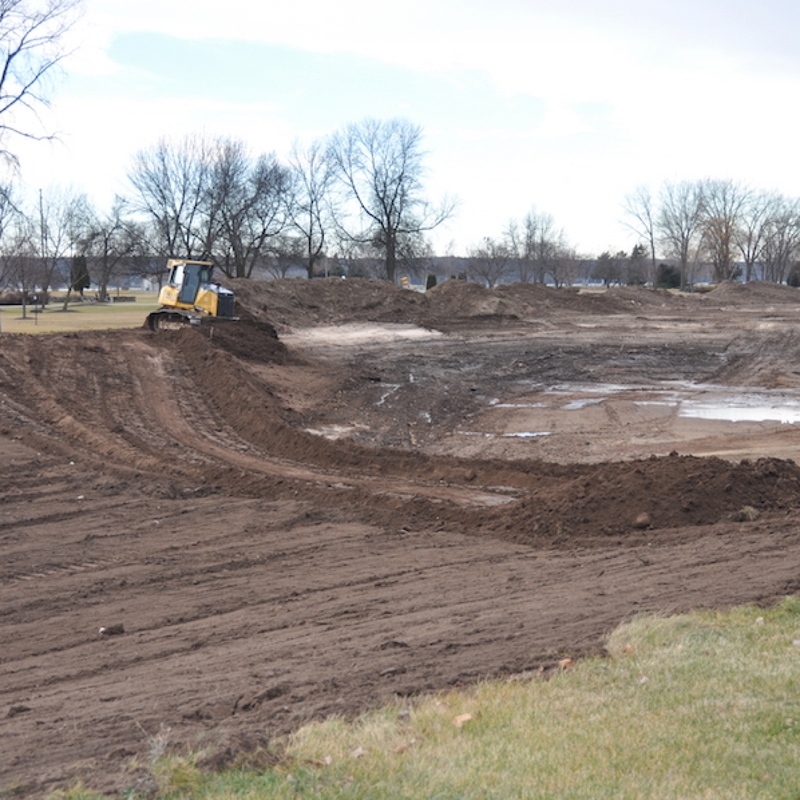 The following is a brief history of our club’s efforts to restore Little Lake. 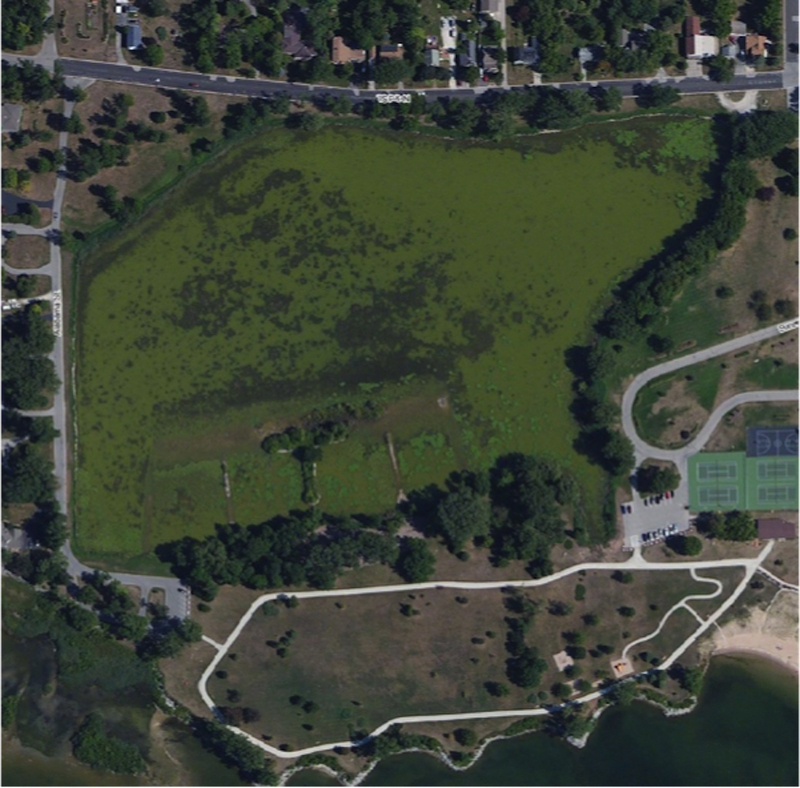 In 1852, Little Lake was called Crystal Lake or Silver Lake. 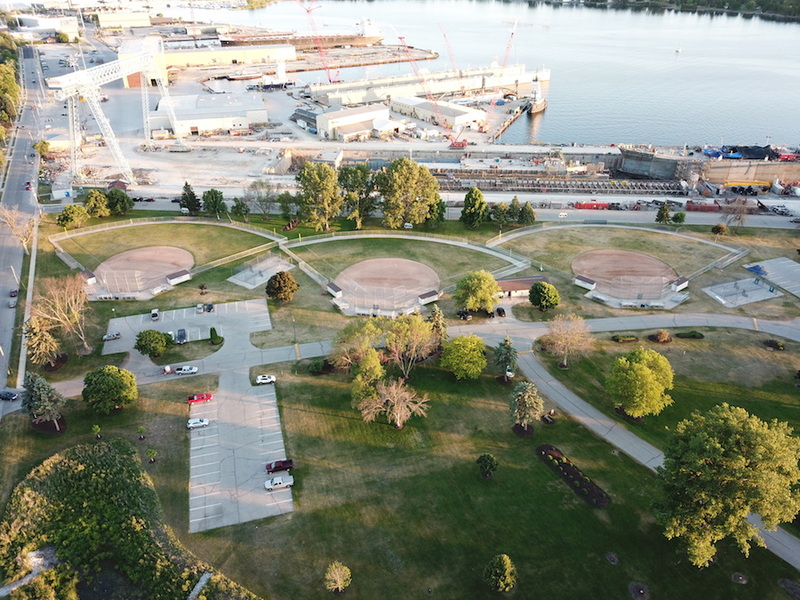 It was a beautiful lake extending south from its present location to what is now the main entrance to Bay Shipbuilding at 3rd Avenue and Georgia Street. 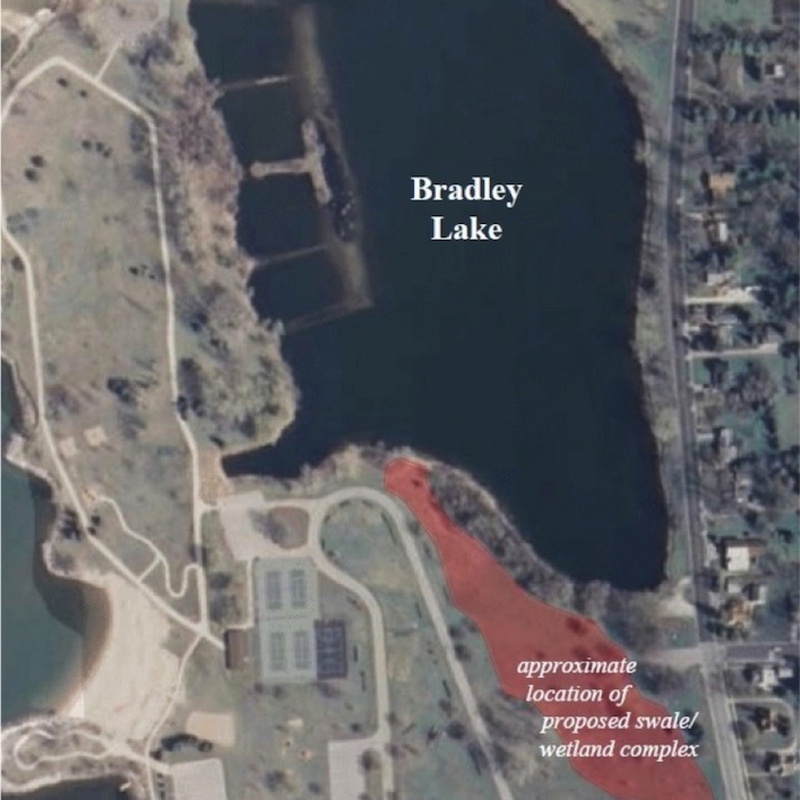 As waste from two nearby sawmills was dumped into the lake, the lake became much smaller, and its name was changed to Bradley Lake or Slab Lake. 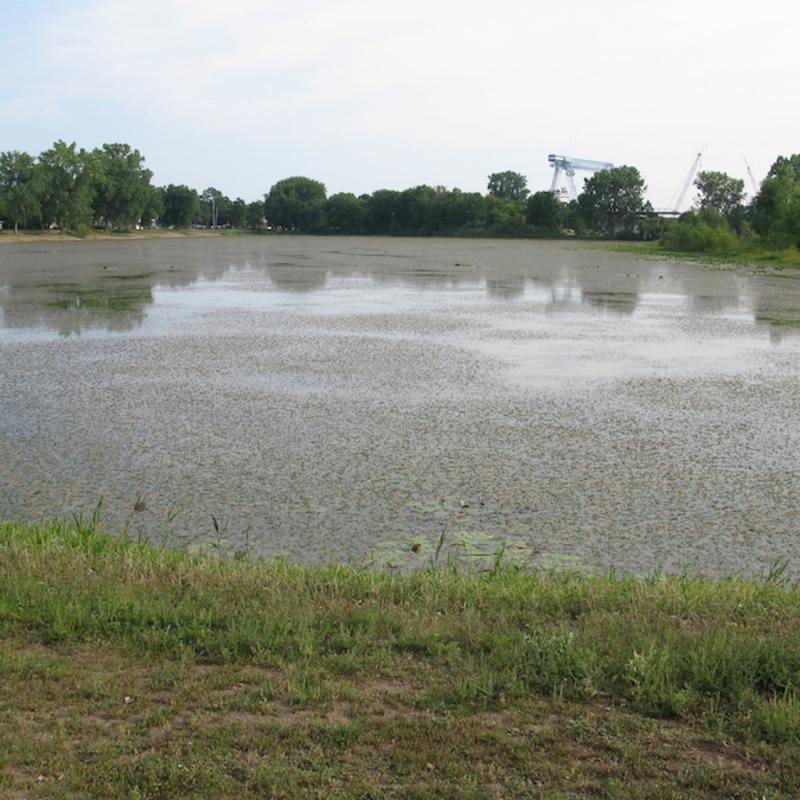 Most people know it as Little Lake or the ‘duck pond’. 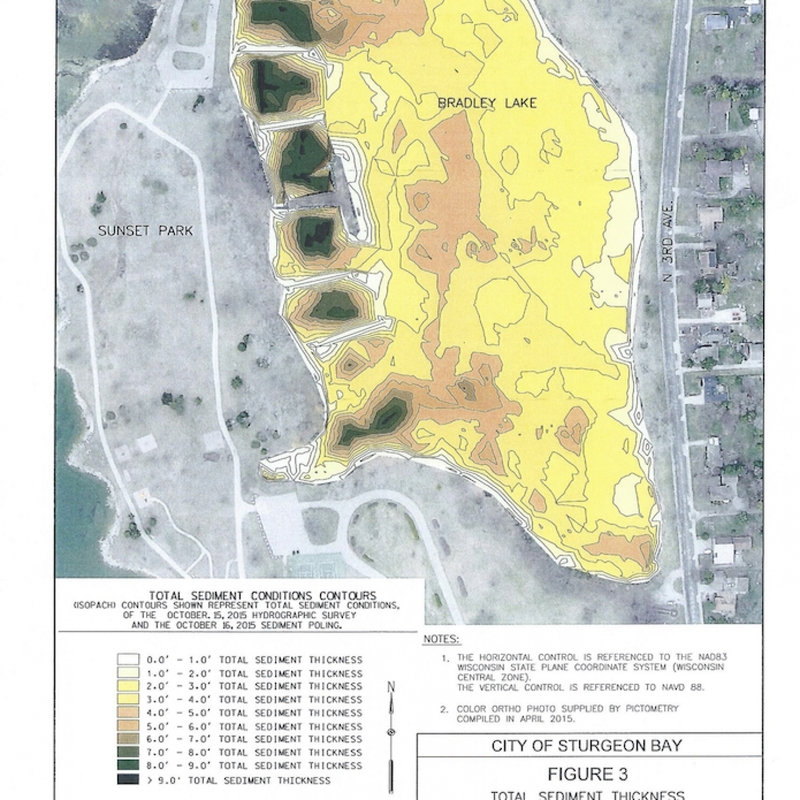 Dr. John Herlache covered this in more detail in the “History of Little Lake” that he researched and wrote in 2012. 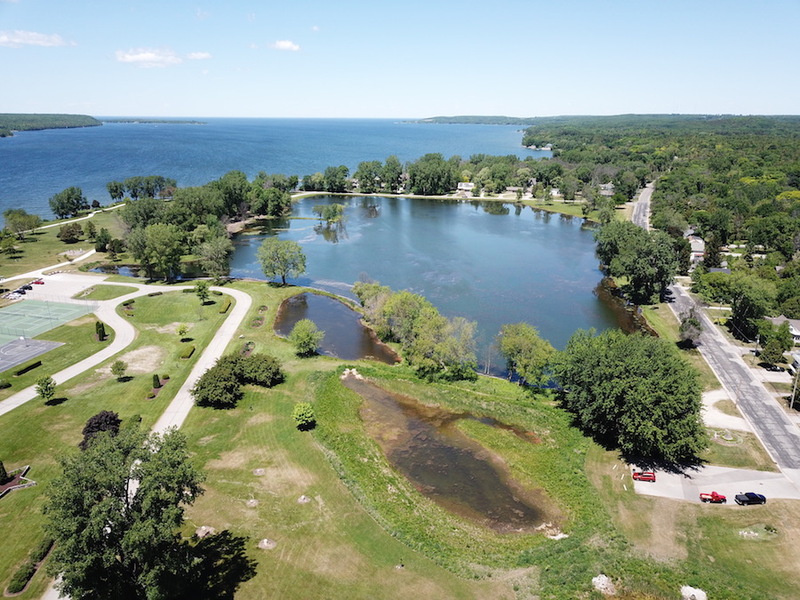 There is a link to the “History of Little Lake” on our Rotary website, and it is 28 pages of very interesting reading. 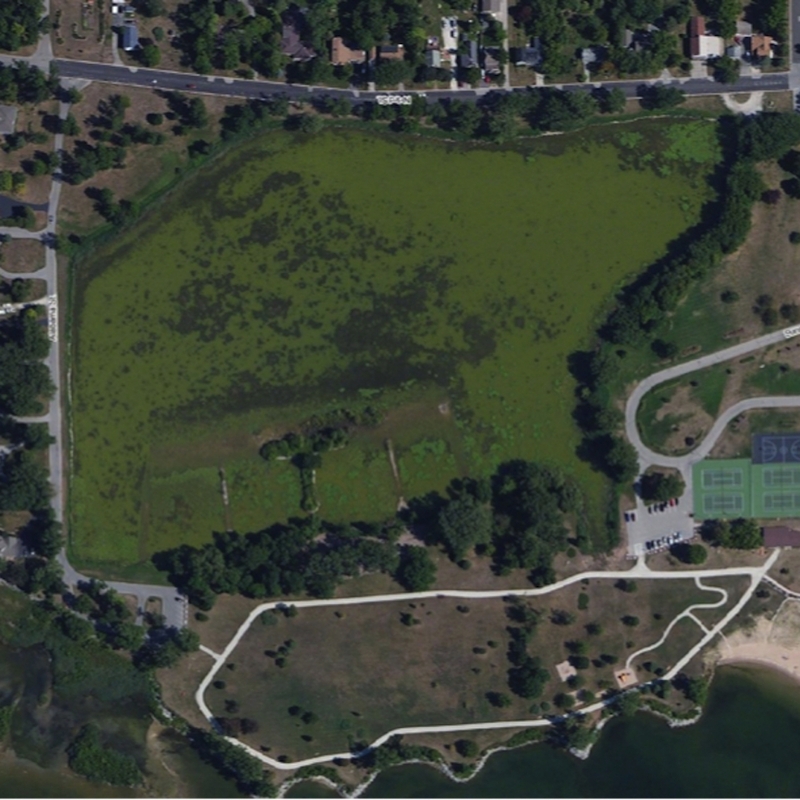 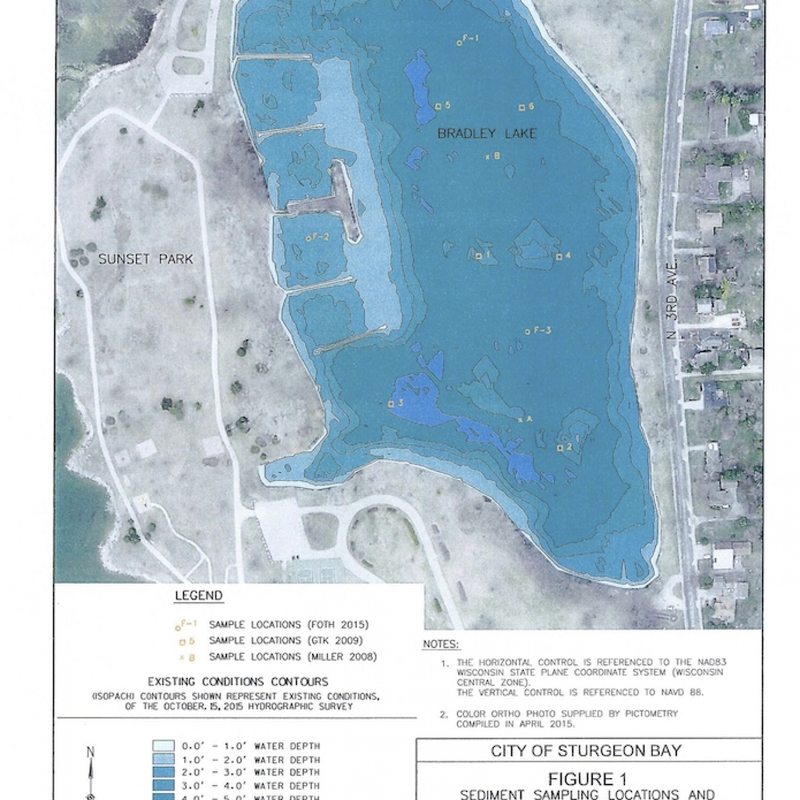 In the summer of 2008, the city asked for input from the public to help decide what to do with Little Lake. 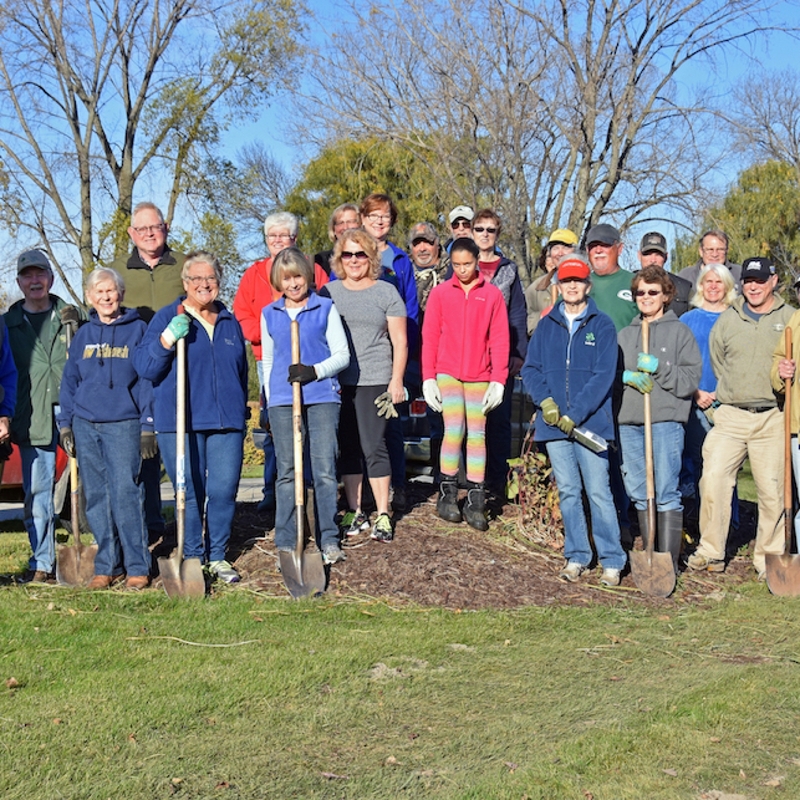 I represented Rotary at several meetings of the Little Lake Citizens Group, and when we were asked if Little Lake should be ‘cleaned up’ or ‘filled in’, the group felt it should be cleaned up, and we wanted to work with the city to help get it done. 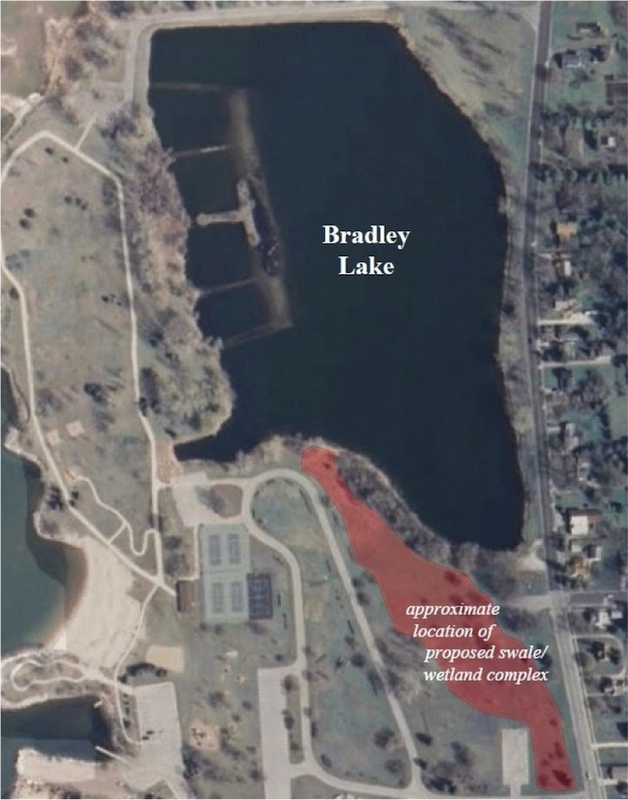 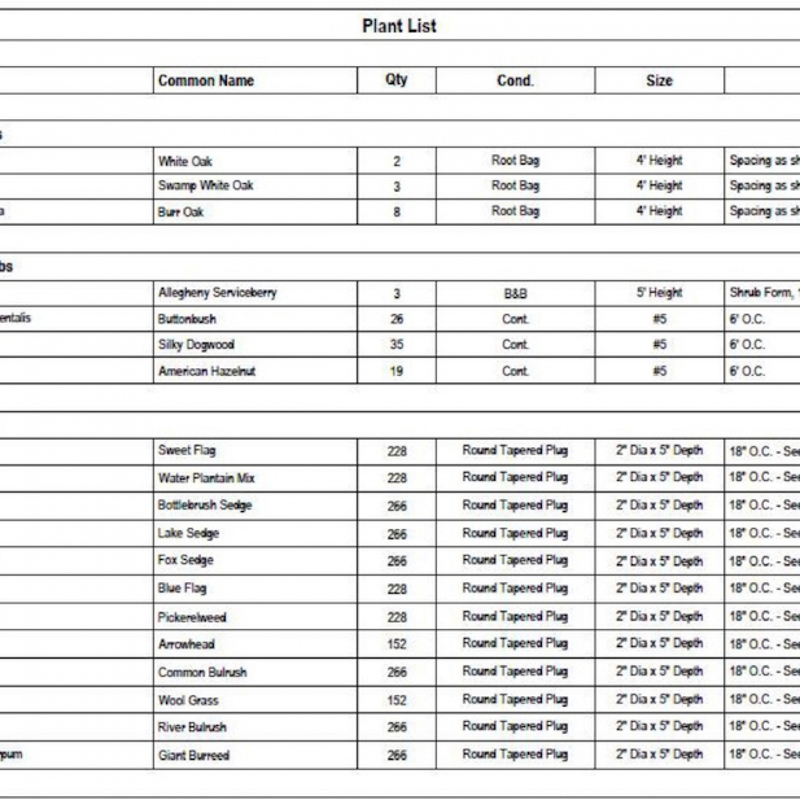 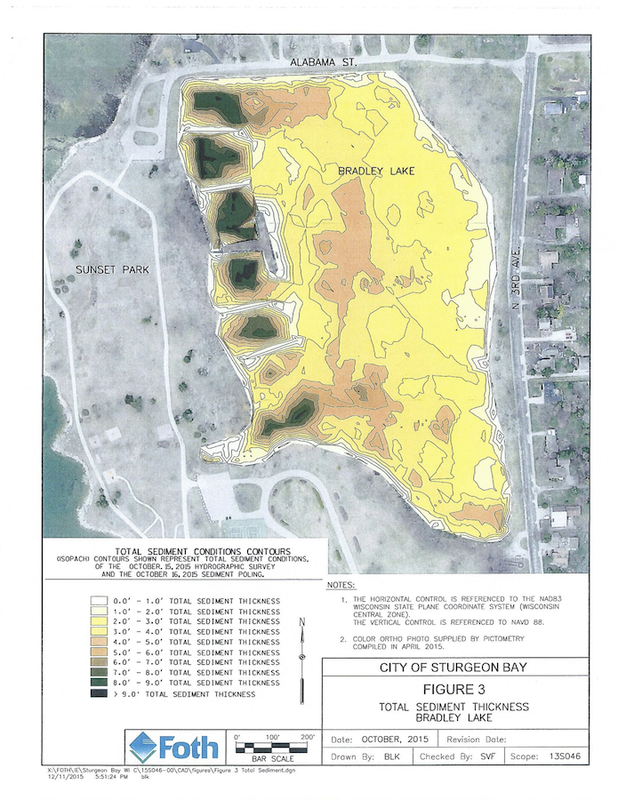 A report prepared for the city by Miller Engineers & Scientists in the fall of 2008 summarized the problems with the lake as follows: Bradley Lake is a 20 acre lake which is heavily influenced by the street runoff from a 260 acre watershed that empties directly into the lake. 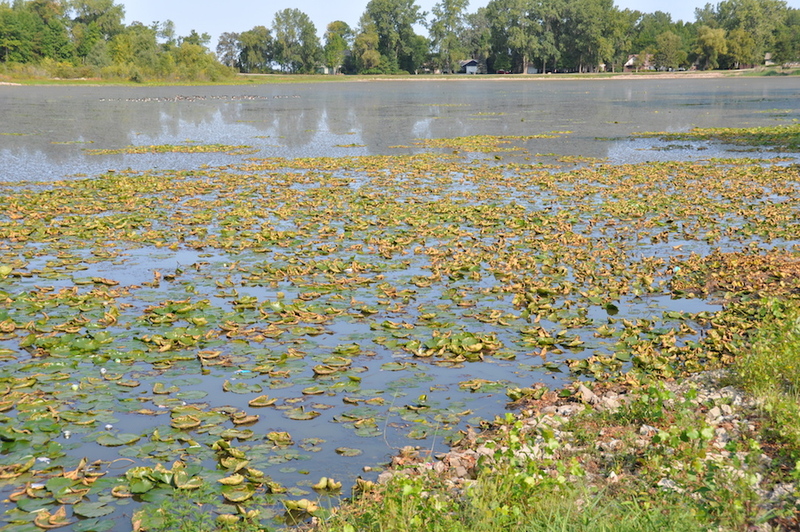 The lake is highly eutrophic, or rich in nutrients, with excessive algae growth. 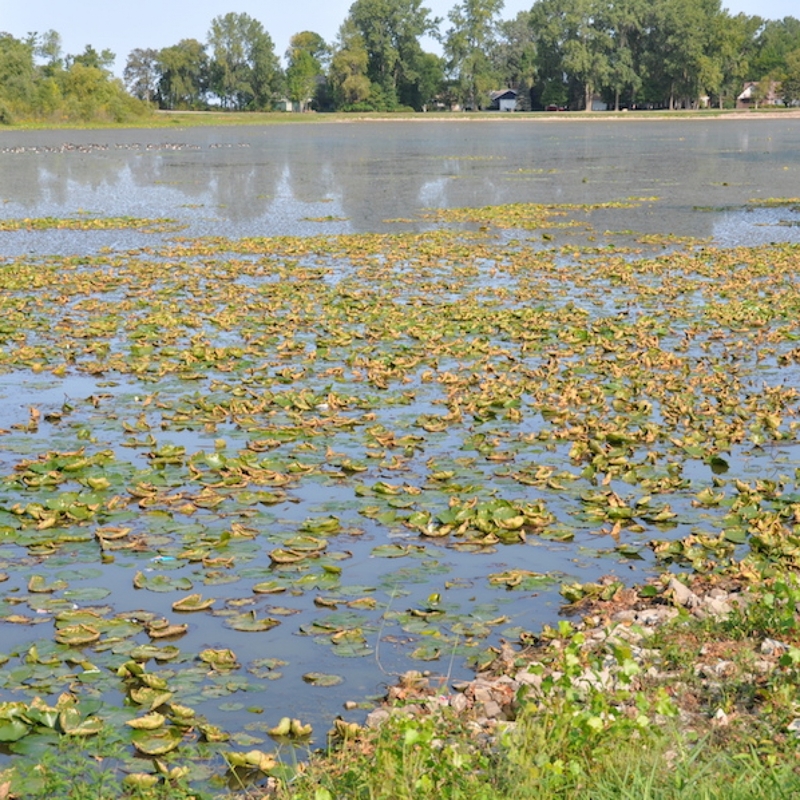 Invasive vegetation and poor water quality result from the shallow water depth, high levels of nitrogen and phosphorus, and low dissolved oxygen levels in the winter. 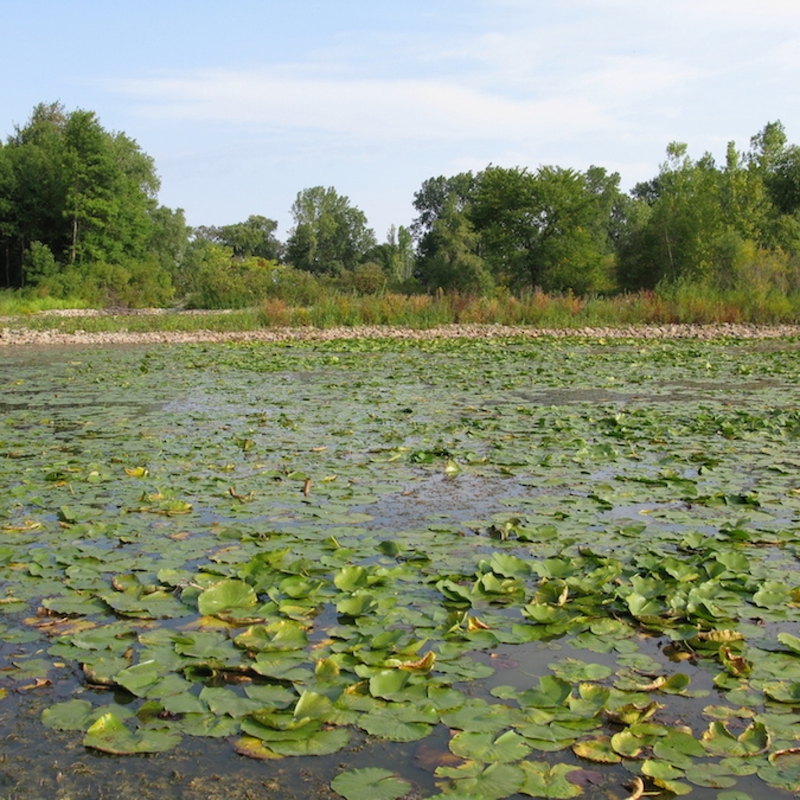 The shallow water depth and the low dissolved oxygen levels prevent desirable fish from surviving through the winter. 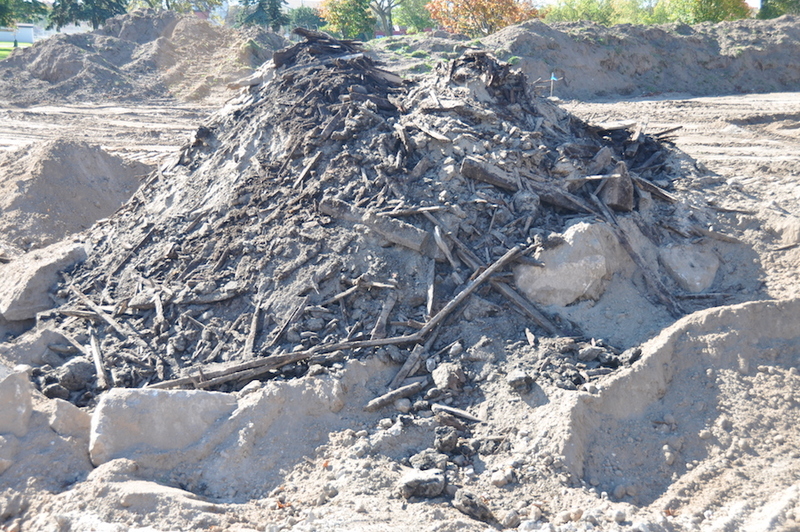 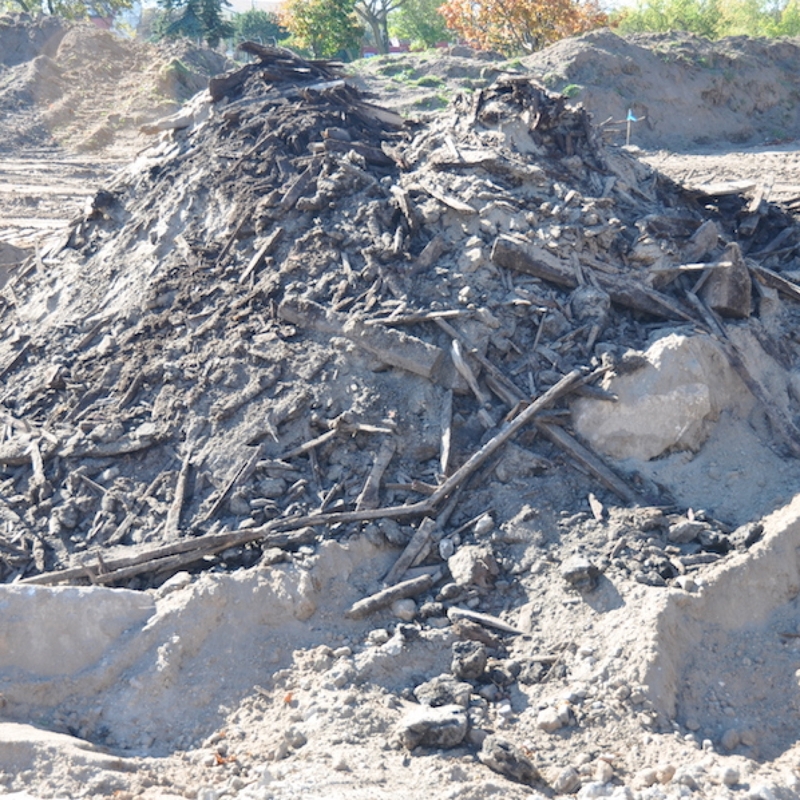 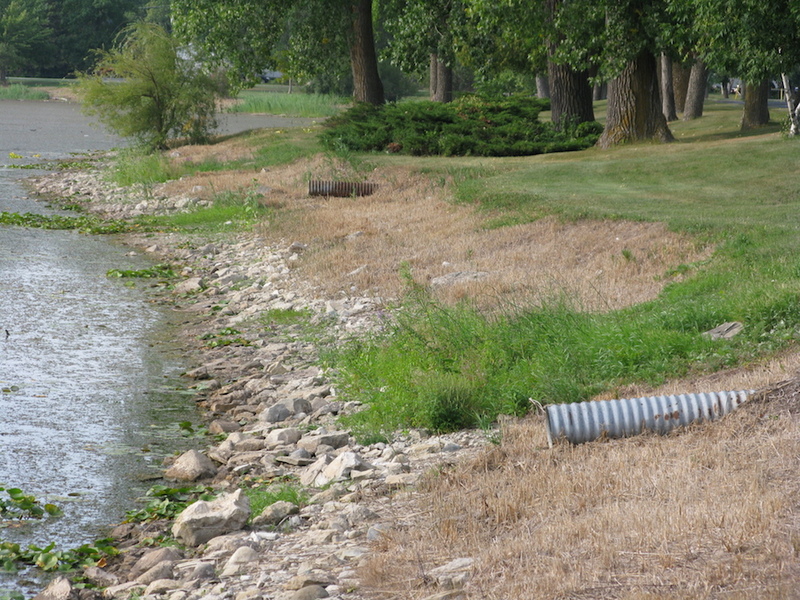 It was also determined that many feet of sediment cover much of the lake bottom. 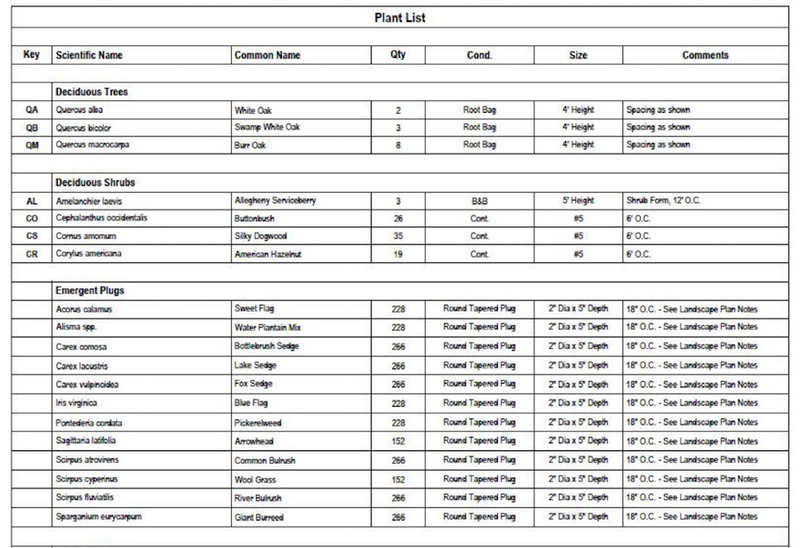 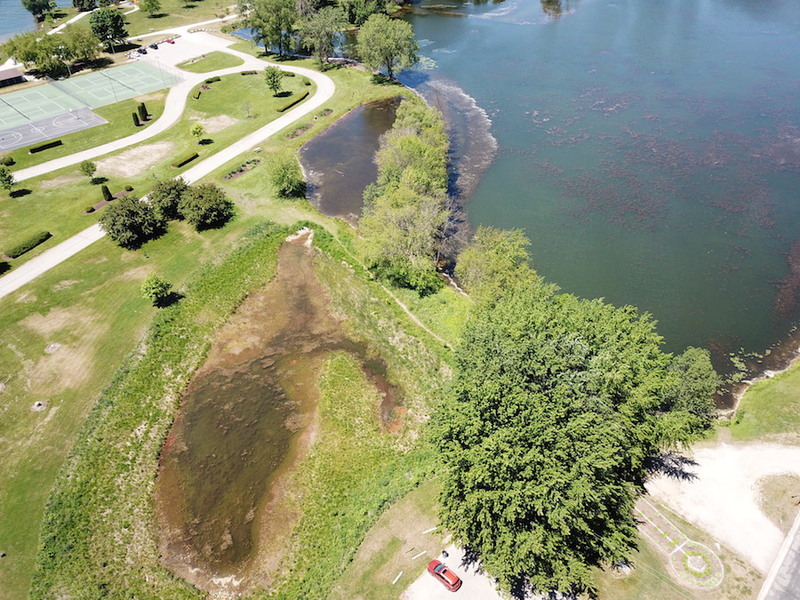 Fortunately, when the sediment was tested, no ‘red flags’ were found, and disposal of the sludge when the lake is dredged should not be a problem. 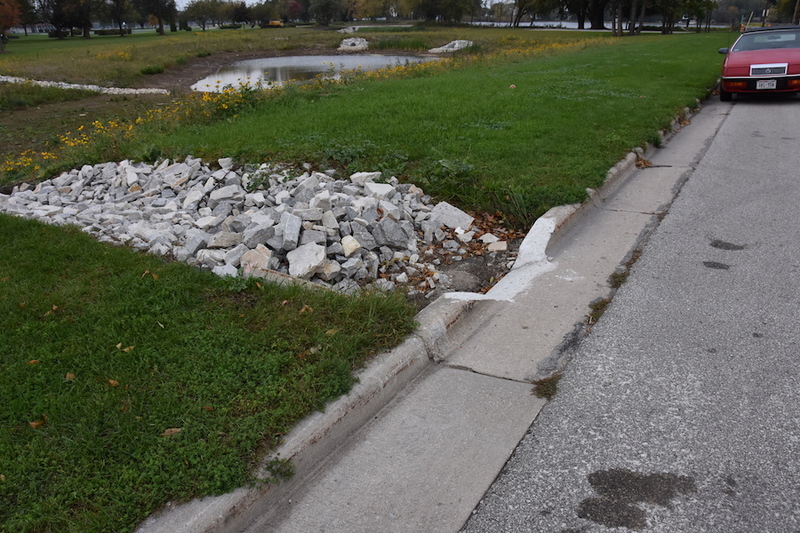 Unfortunately, Municipal Services Director, Bob Bordeau, was not able to find grant money to fix the problems mentioned in this report. 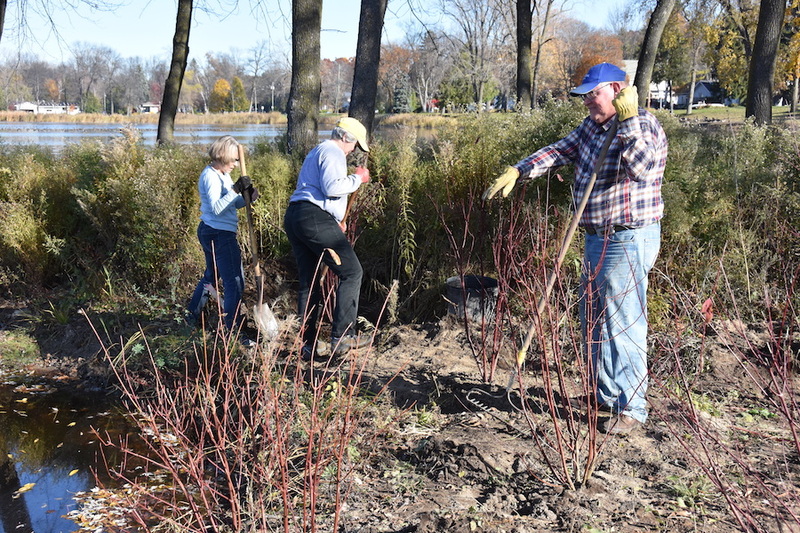 In the spring of 2010, Greg Meissner and I presented Bob with a check from Rotary for $1,500 to help clear brush on the west side of the lake. 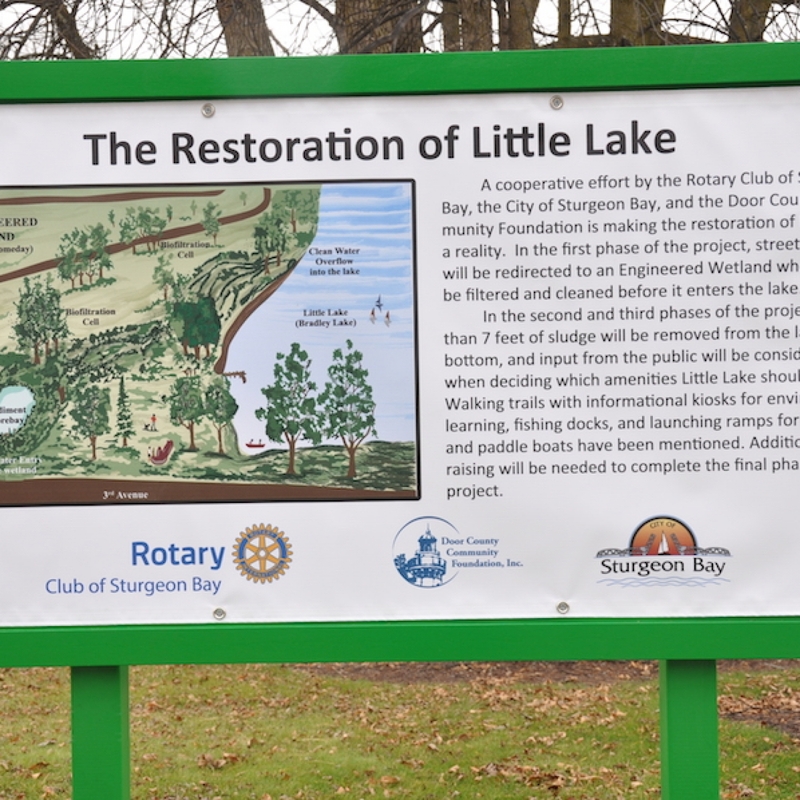 In the summer of 2012, I received a call from a good friend from high school who lives near Little Lake asking if Rotary could do something about the lake. 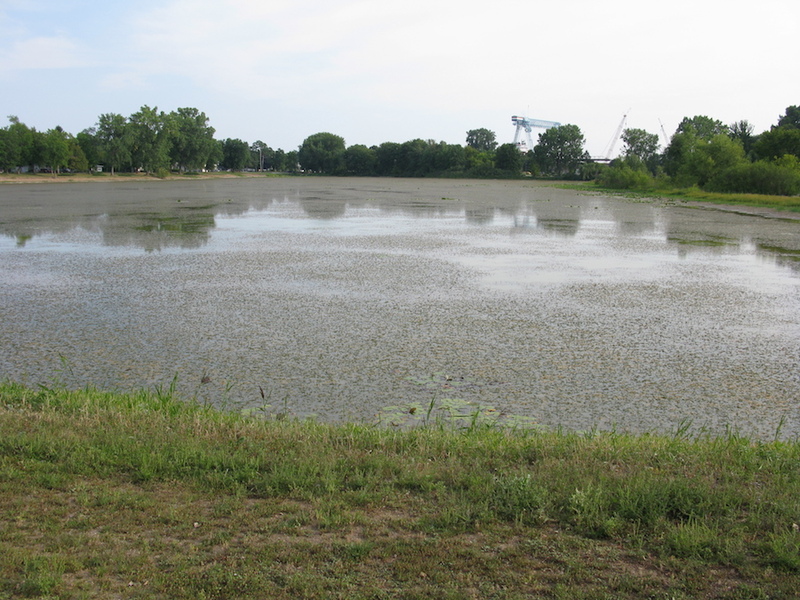 Keith said the lake looked terrible and even smelled bad. 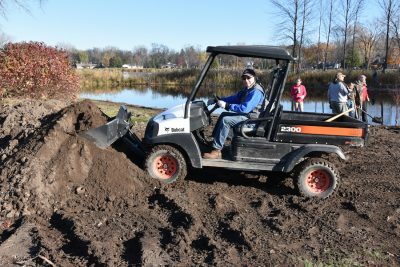 He knew our Rotary club had been working to improve Sawyer Park, and he was hoping we could also do something to improve Little Lake. 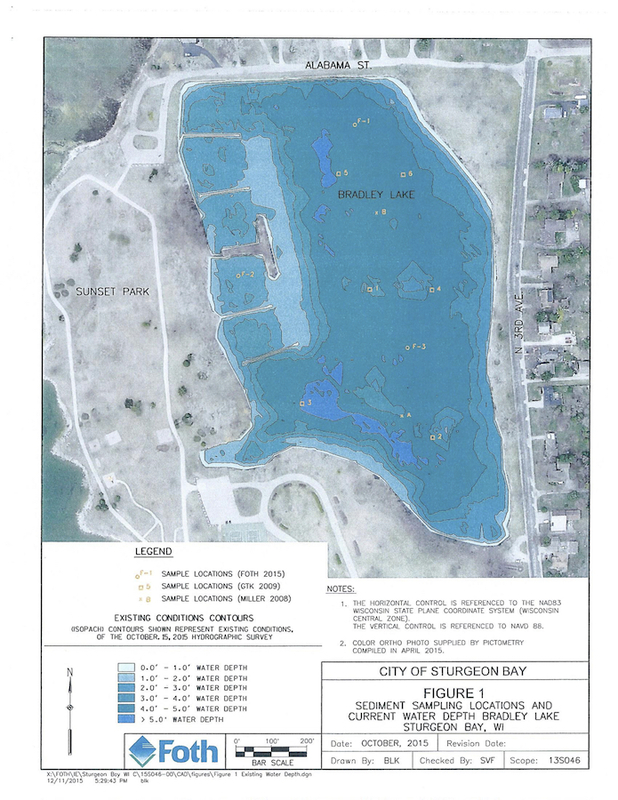 I called Greg and we decided this would be an interesting project for the Environmental Protection Committee, which Greg and I co-chair. 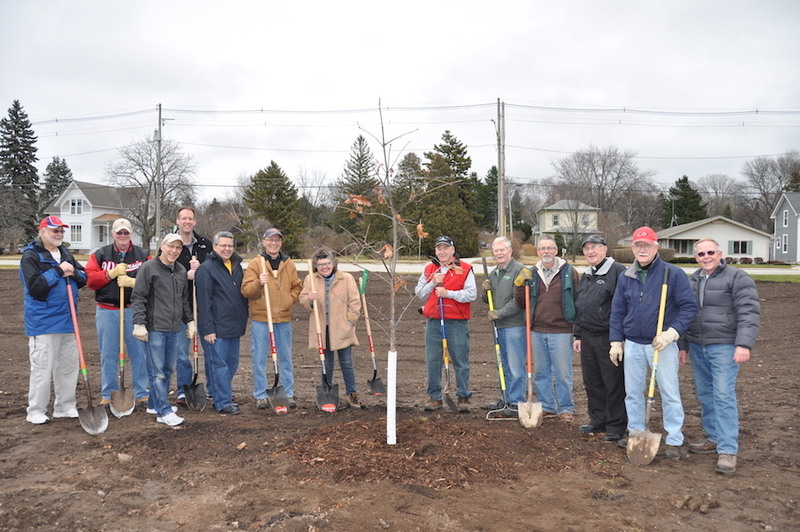 More importantly, we felt it was a way for Rotary to ‘give something back to the community’. 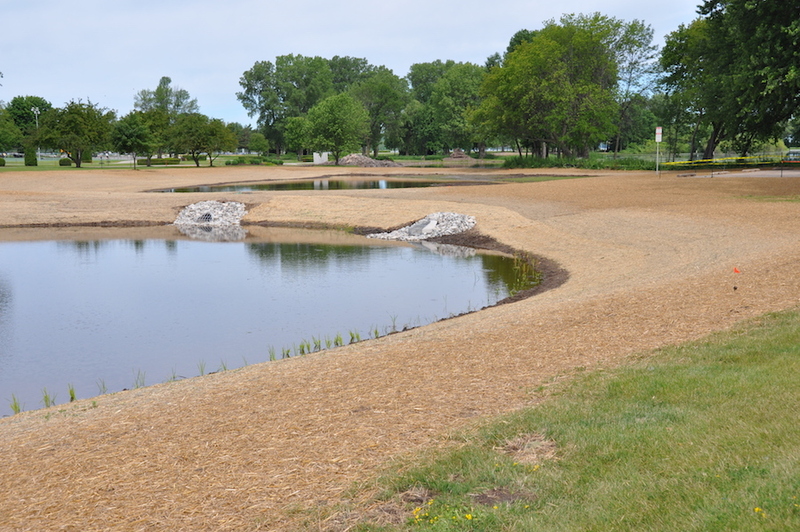 Although the city was very supportive of the project, they did not have money budgeted for Little Lake. 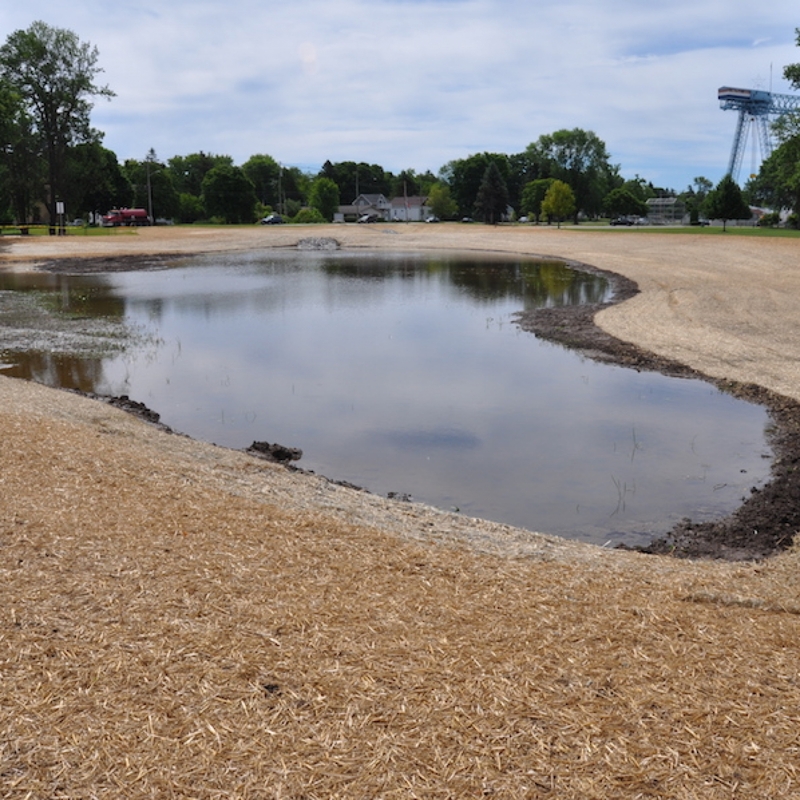 Fortunately, we learned that grant money might again be available for lake restoration projects. 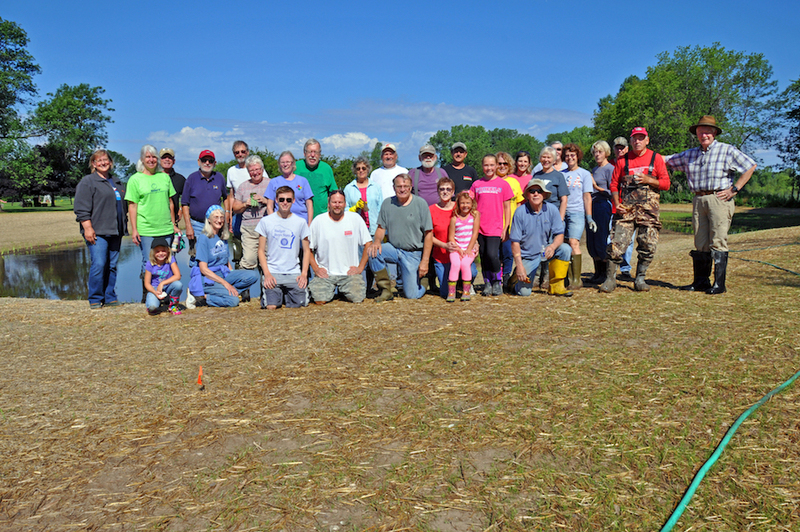 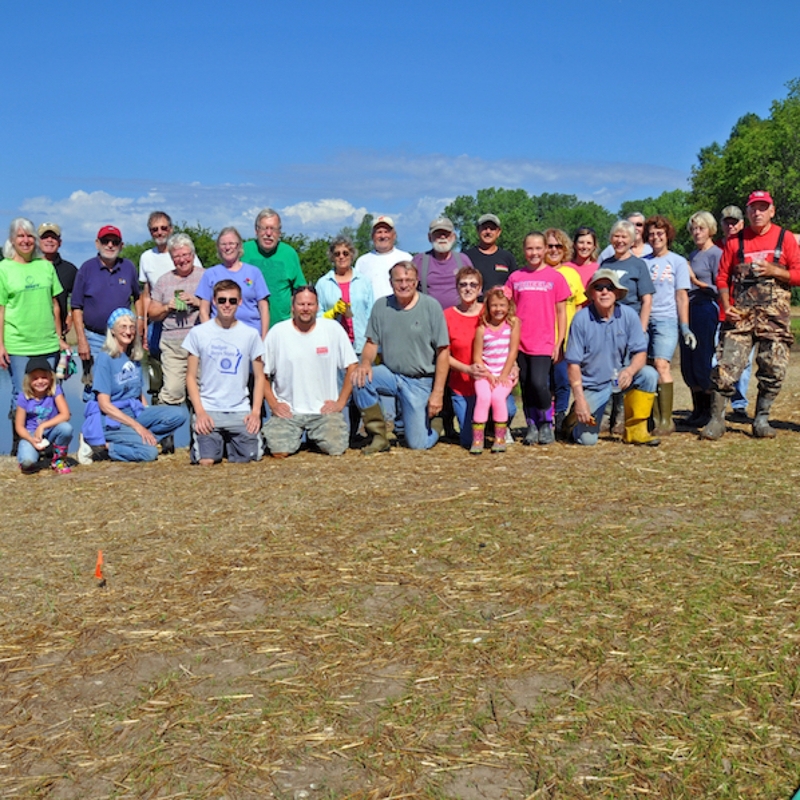 In January of 2013, almost 30 people, many of them Rotarians, met and enthusiastically supported the Restoration of Little Lake. 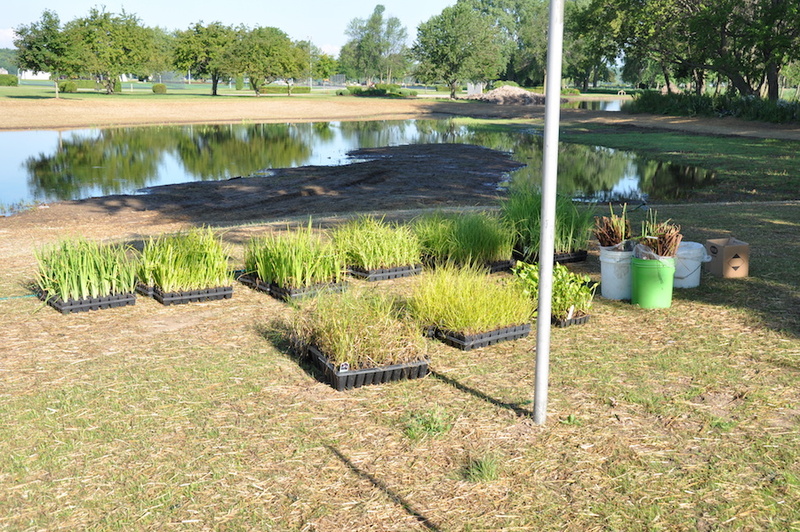 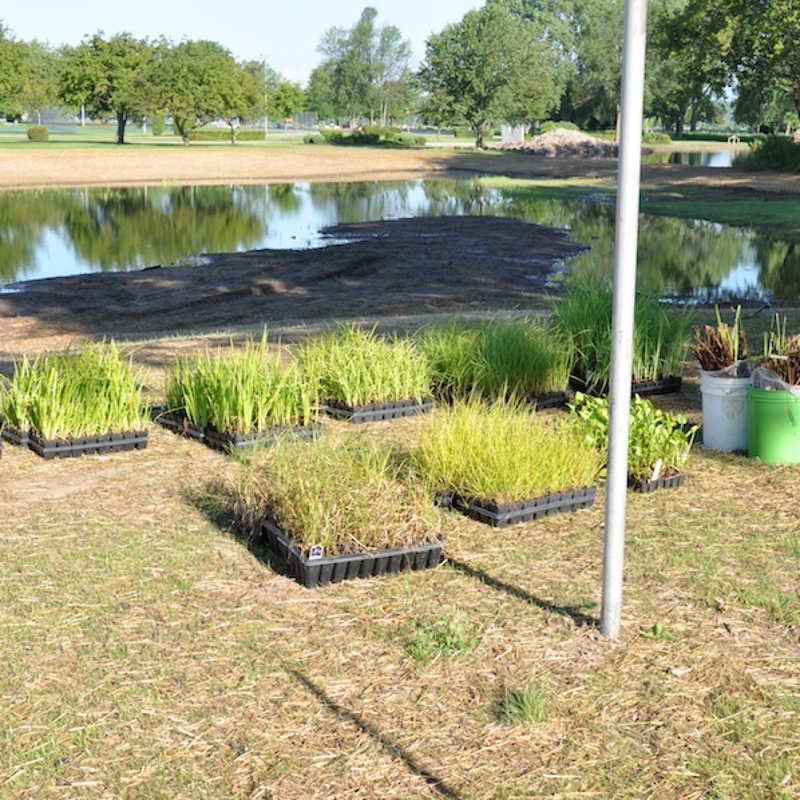 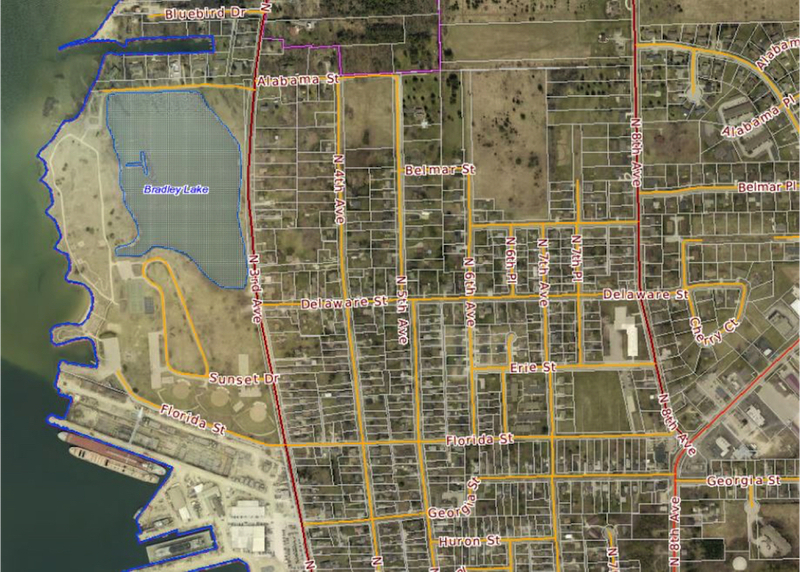 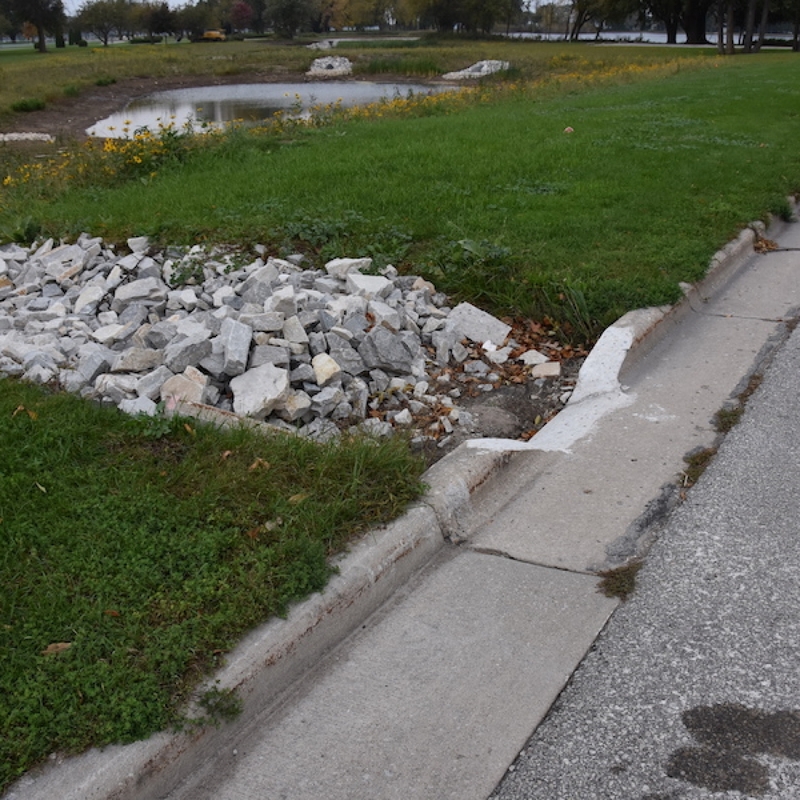 By February of 2014, the city was working with Foth Infrastructure and Environment, and they determined an Engineered Wetland should be built south of Little Lake in Sunset Park to filter and clean the street runoff, or storm water, before it entered the lake. 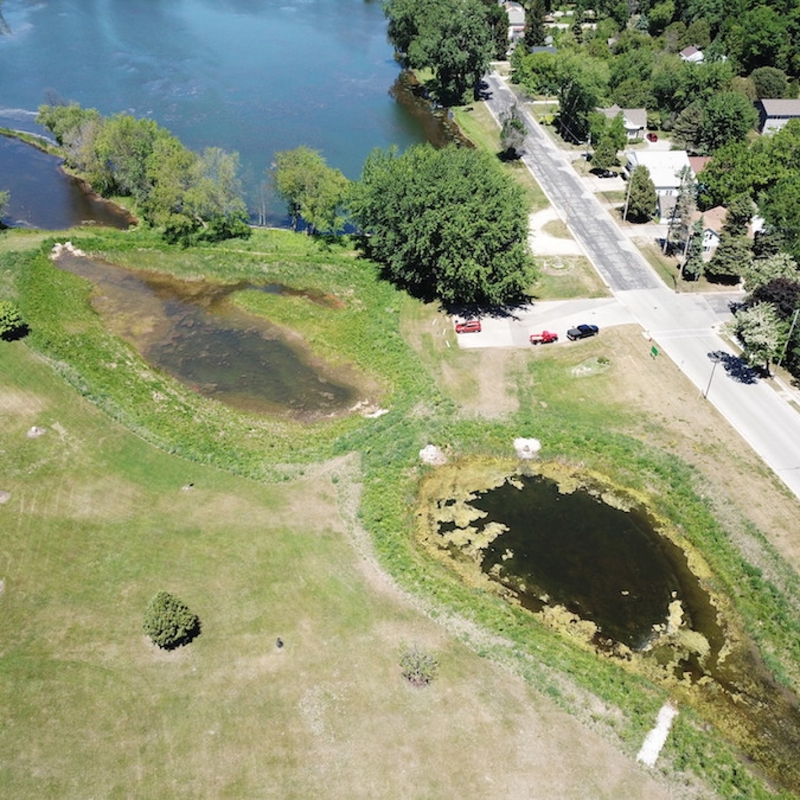 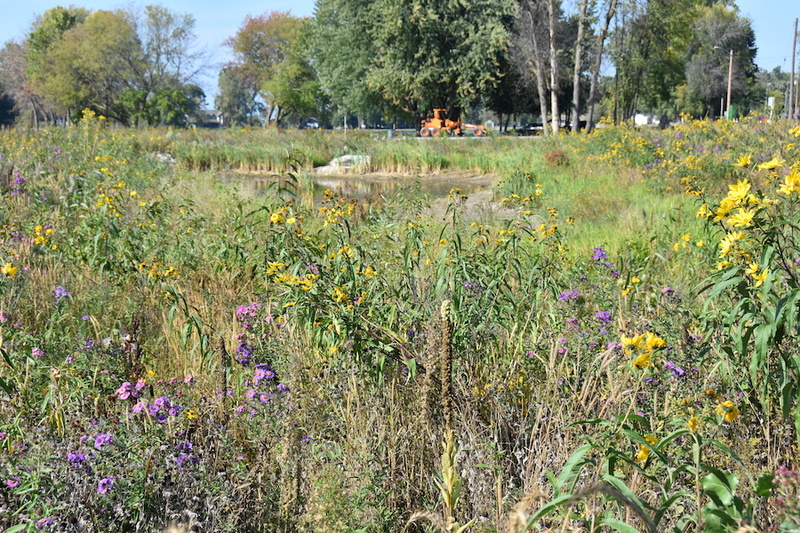 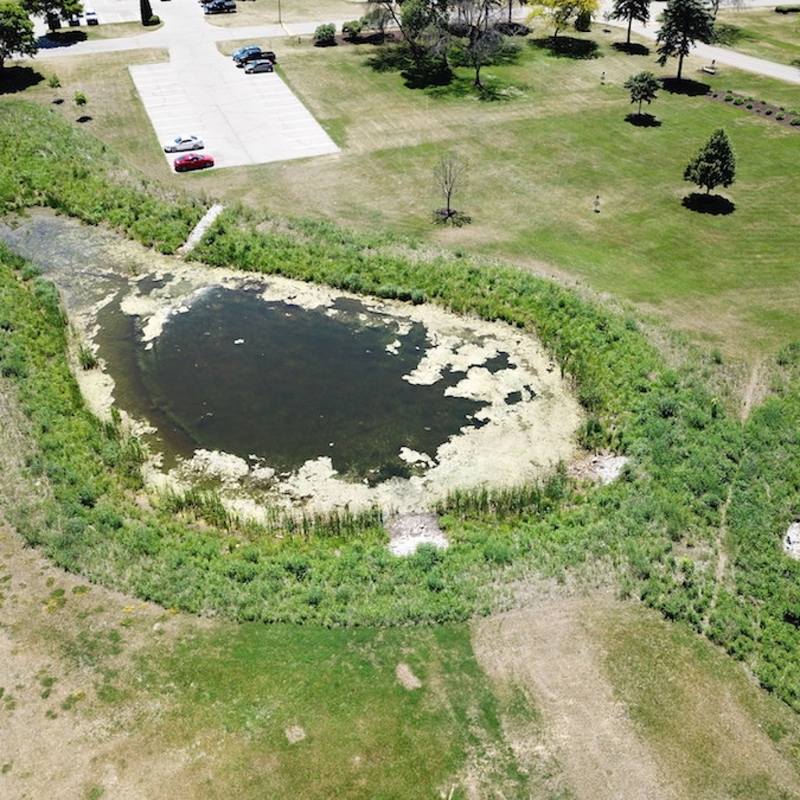 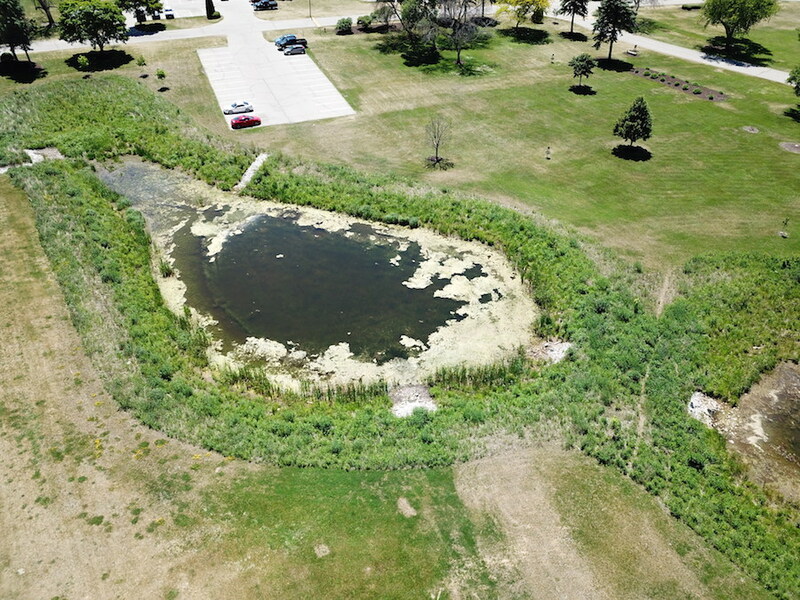 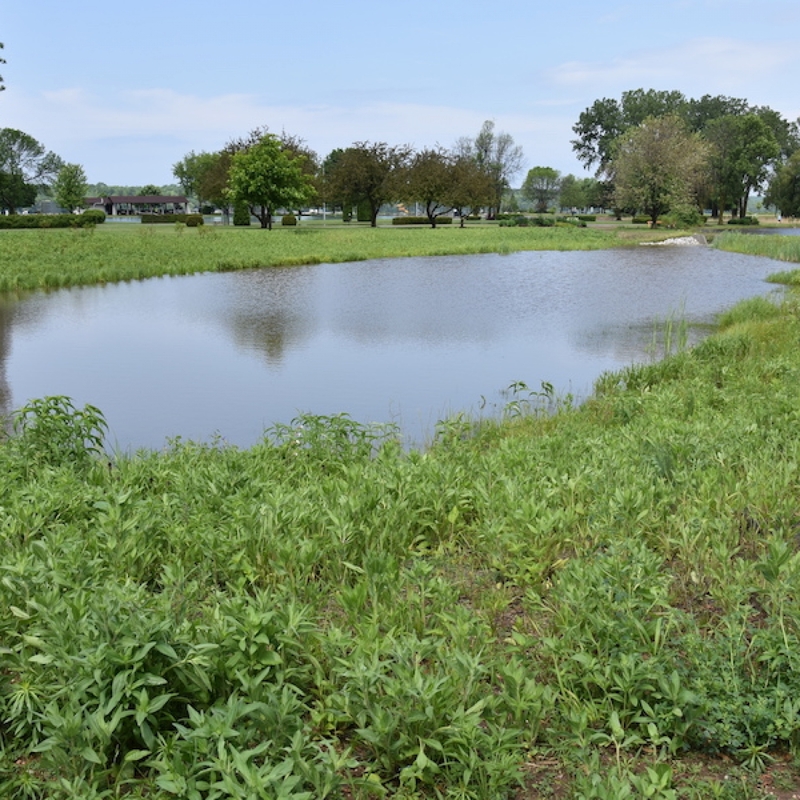 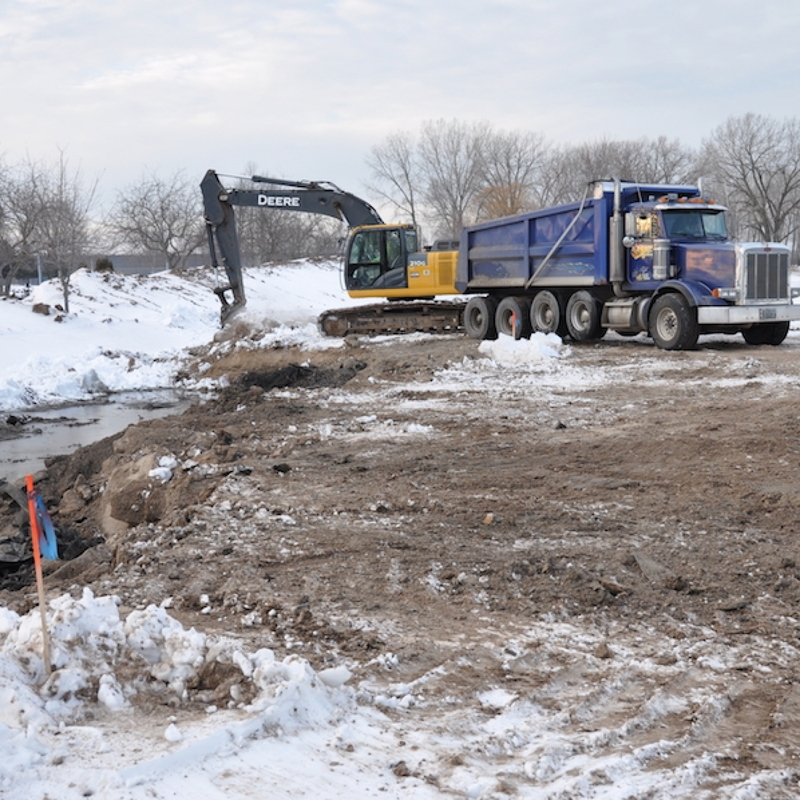 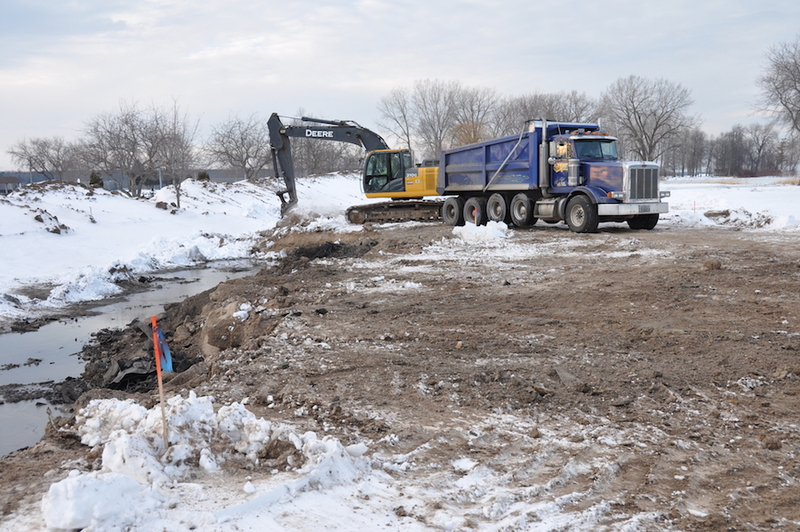 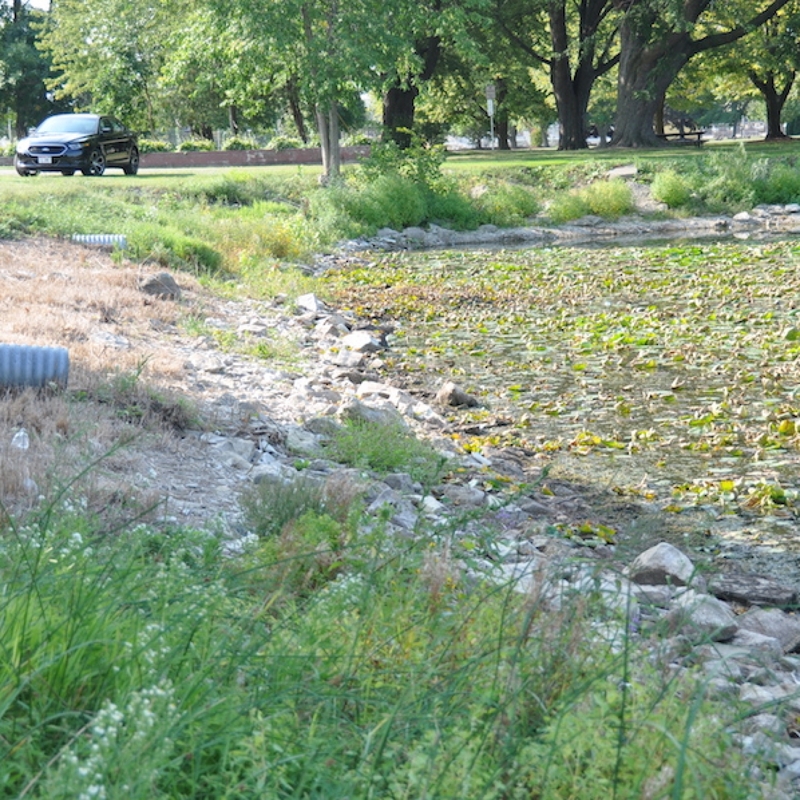 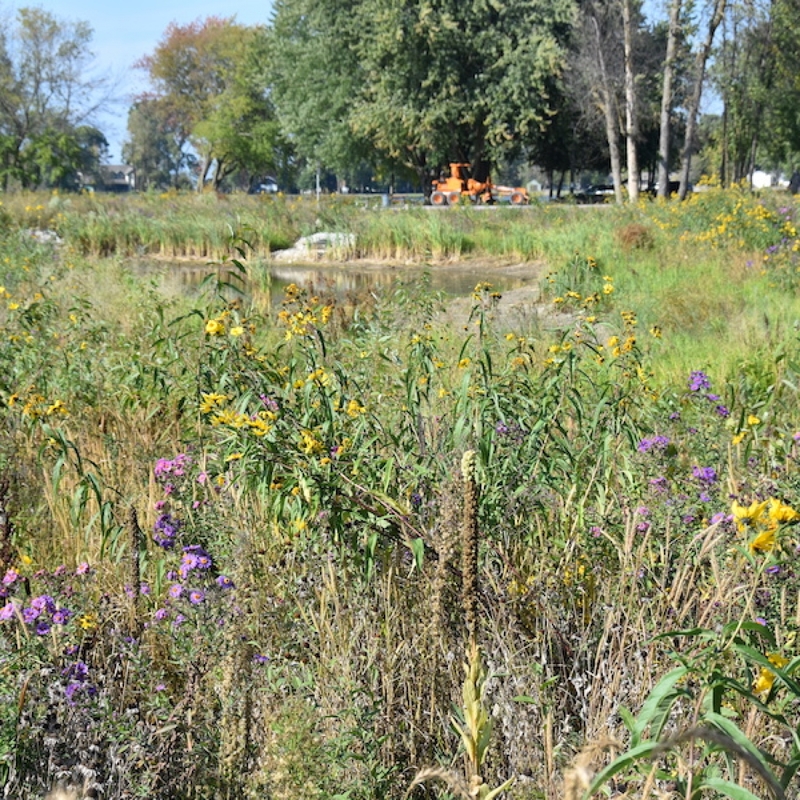 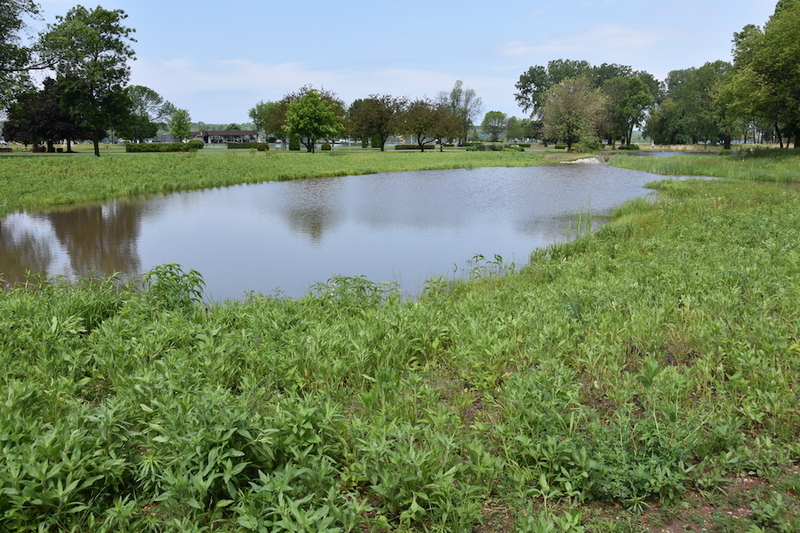 The city began aggressively applying for grant money, and in July of 2014 received a check for $100,000 from the Fund for Lake Michigan to construct the wetland. 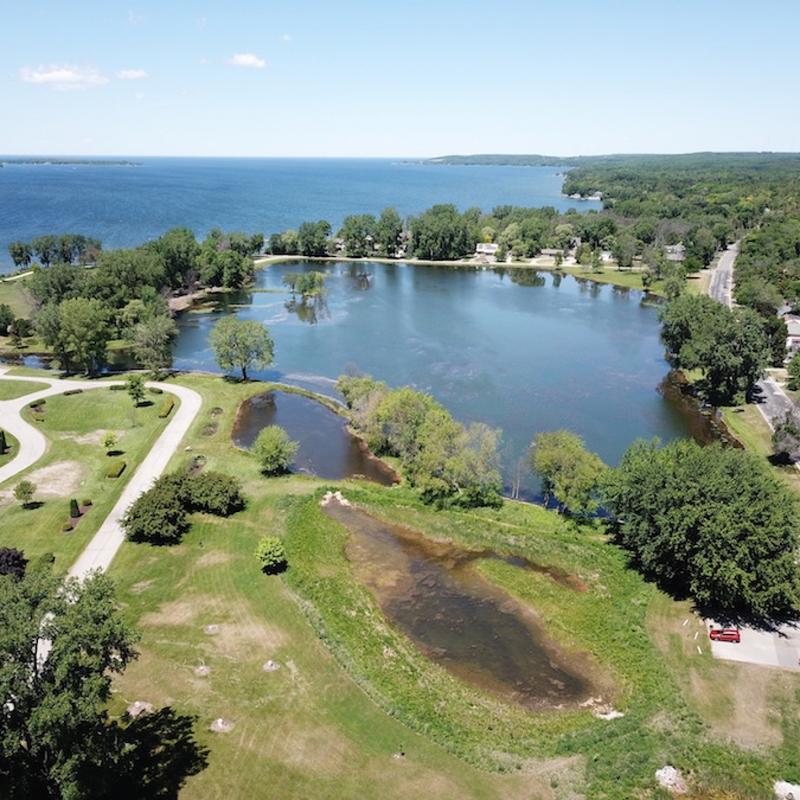 A Little Lake Restoration Fund was set up at the Door County Community Foundation, and a successful fundraising campaign chaired by Dr. John Herlache, as well as generous donations from Rotary and individual Rotarians, raised almost $100,000 for the Little Lake Project. 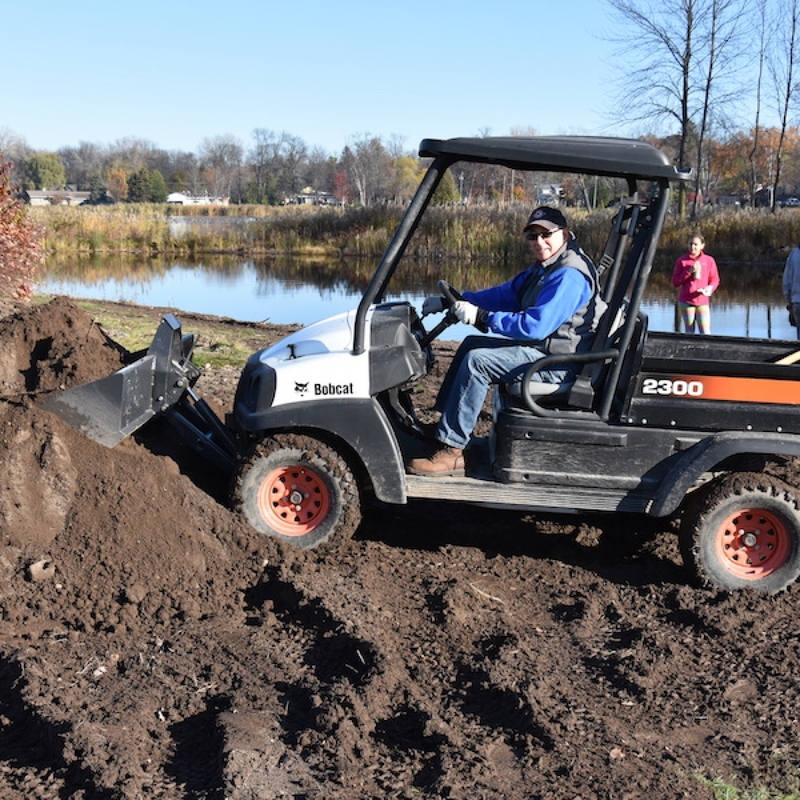 Brian Hinrichs from Foth told us he had never worked on a project where the stakeholders, in this case Rotary, had provided so much financial support for the project. 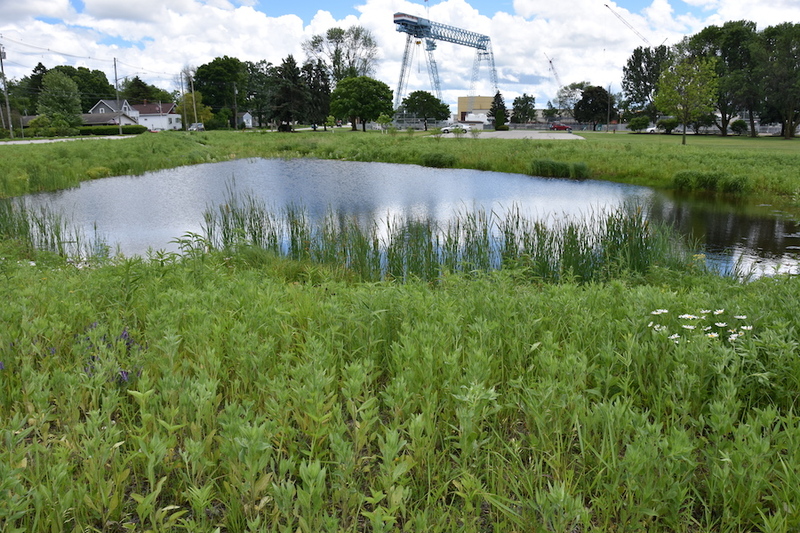 The city also budgeted money for Little Lake and secured additional grant money, enabling work to begin in 2015 on the First Phase of the project, the construction of a $300,000 Engineered Wetland. 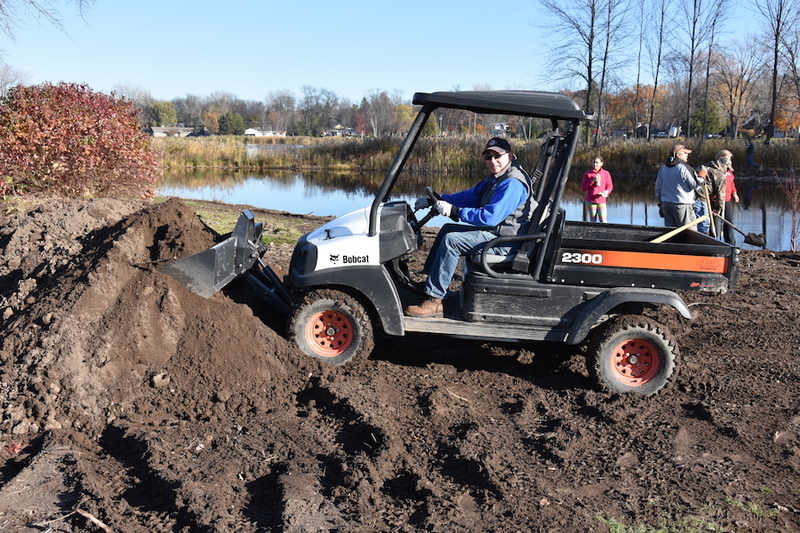 Rass Excavating has completed the Engineered Wetland, and our Rotary club, with help from Greg and Marsha Meissner, the Master Gardeners, and volunteers from the community planted the required vegetation in and around the three cells which are now filtering the storm water before it empties into Little Lake. 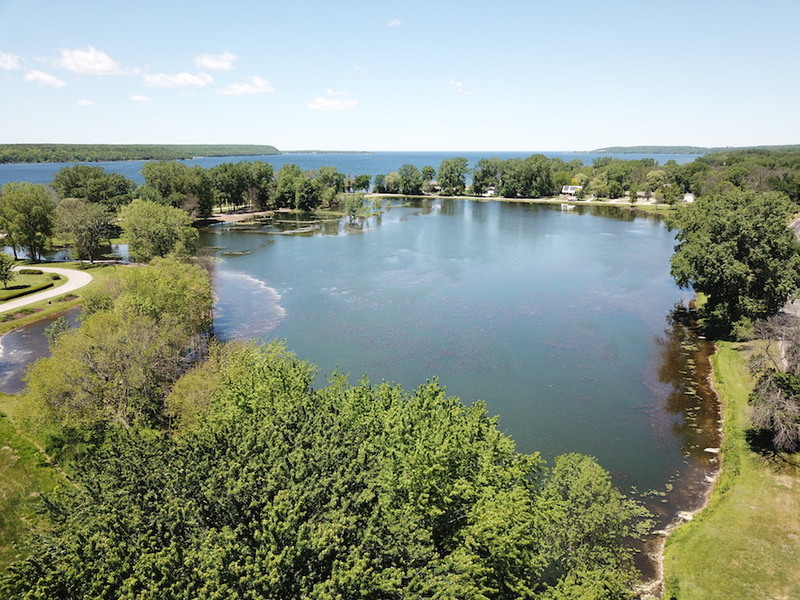 Because the water levels in Lake Michigan, the Bay of Sturgeon Bay and Little Lake are so high right now, the water in Little Lake actually looks quite good. 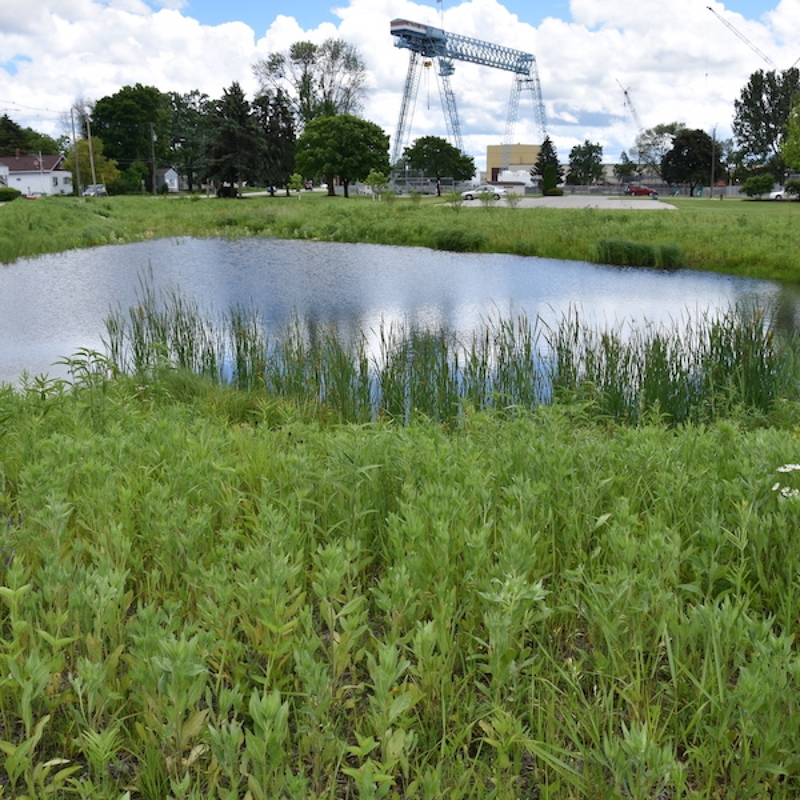 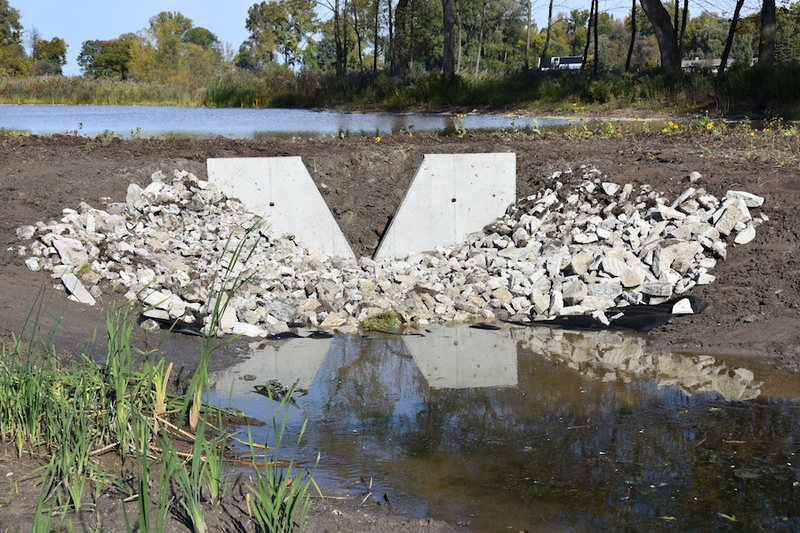 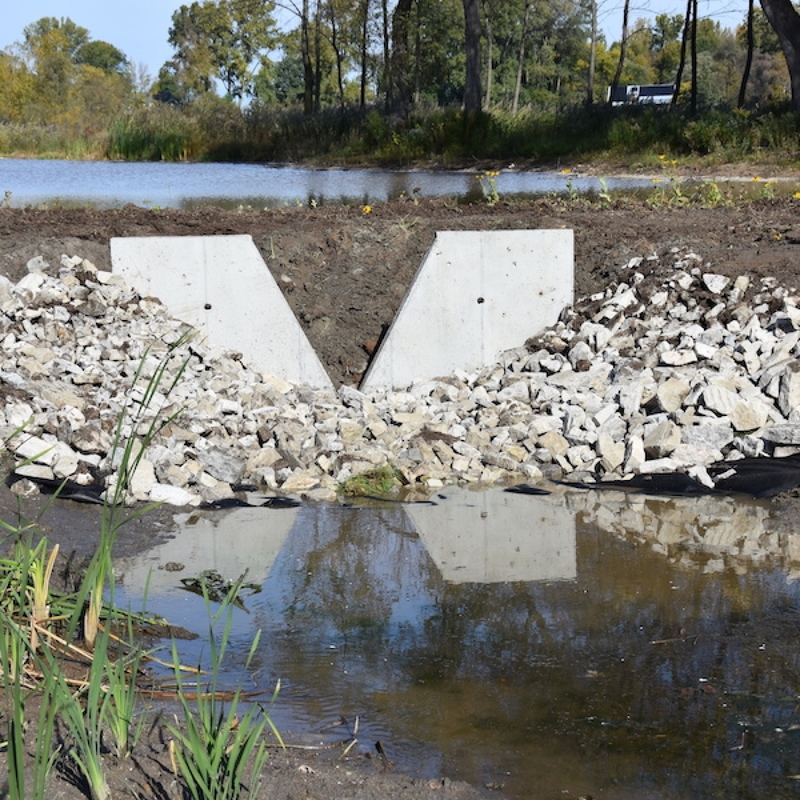 In the future, when the water level in Little Lake goes down, the Engineered Wetland will continue to help keep the storm water that flows into Little Lake free of contaminants. 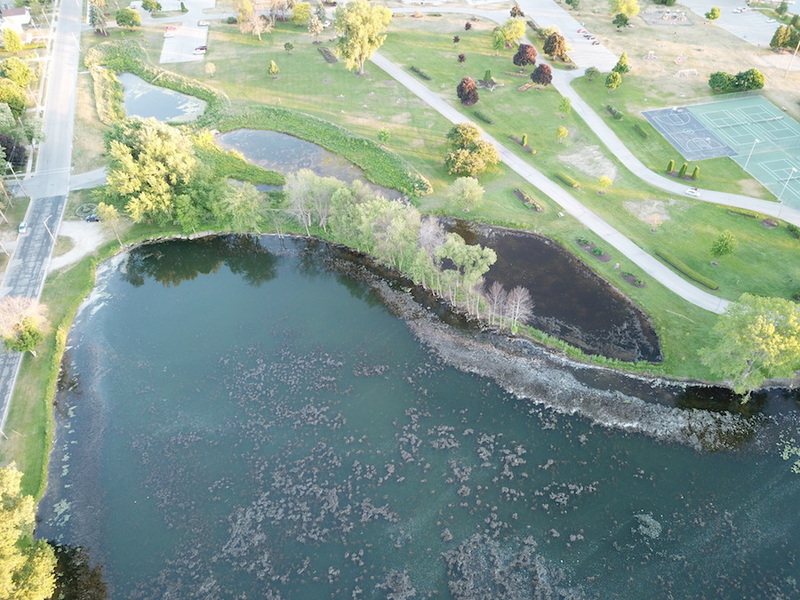 Click on the first image to expand the aerial photography gallery. 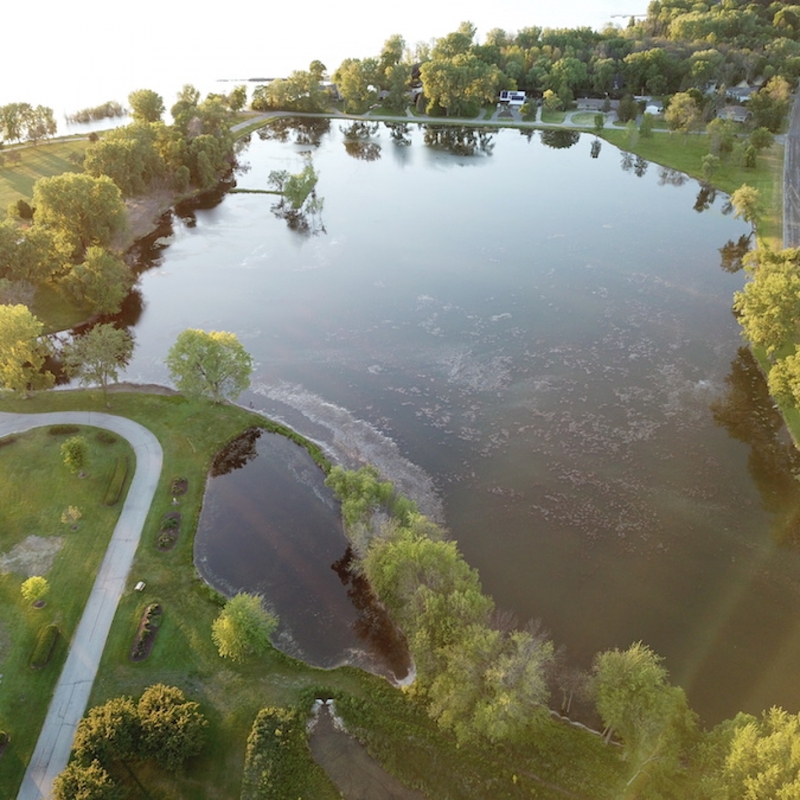 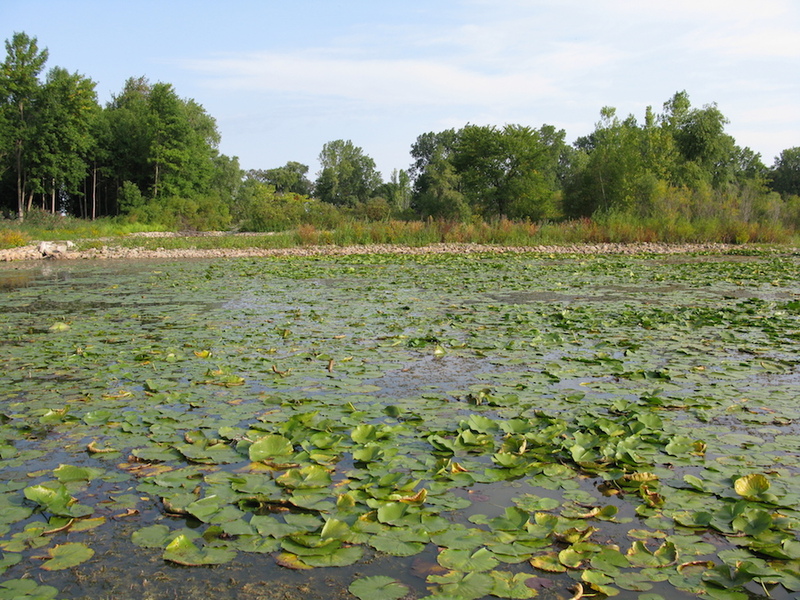 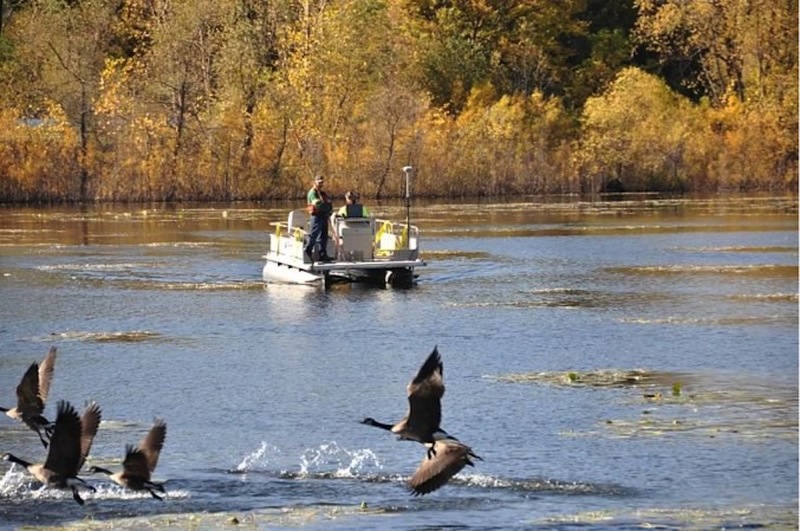 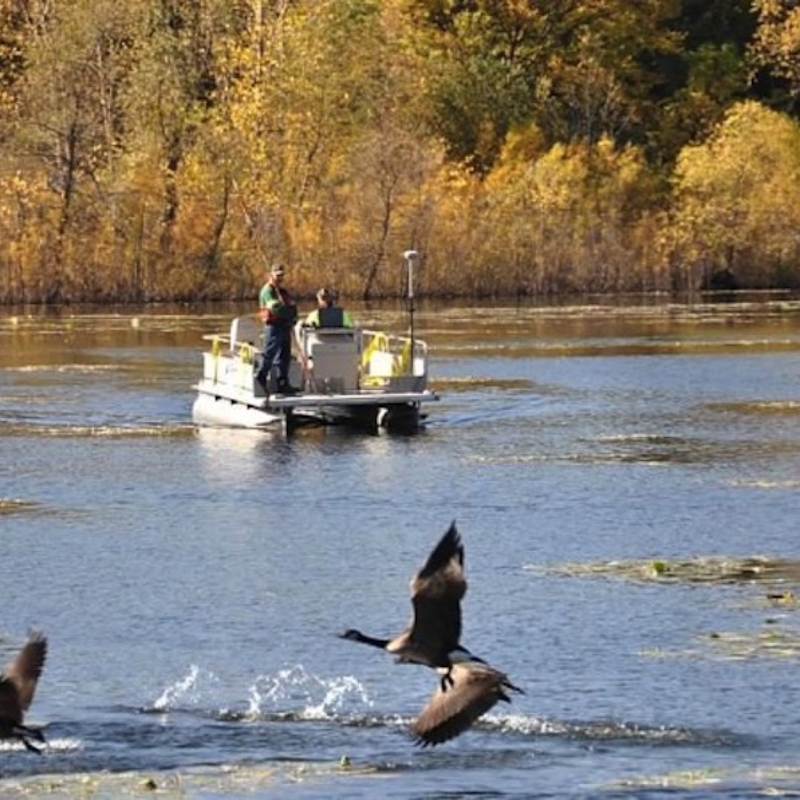 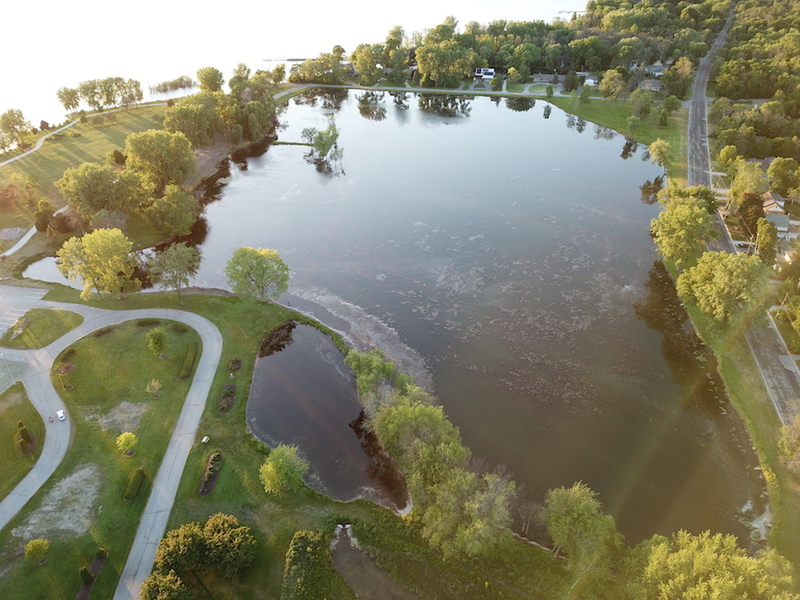 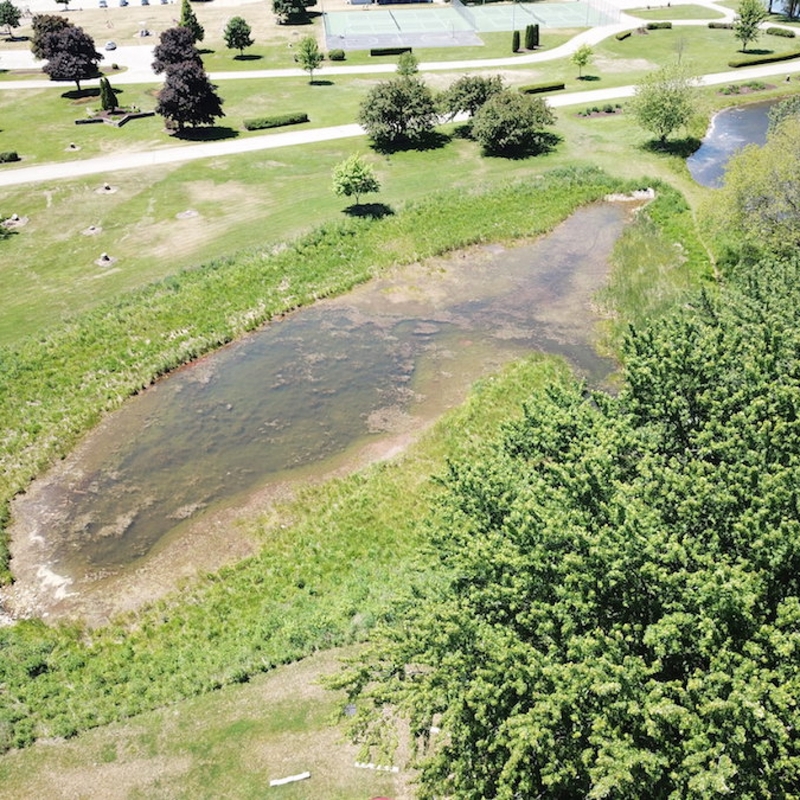 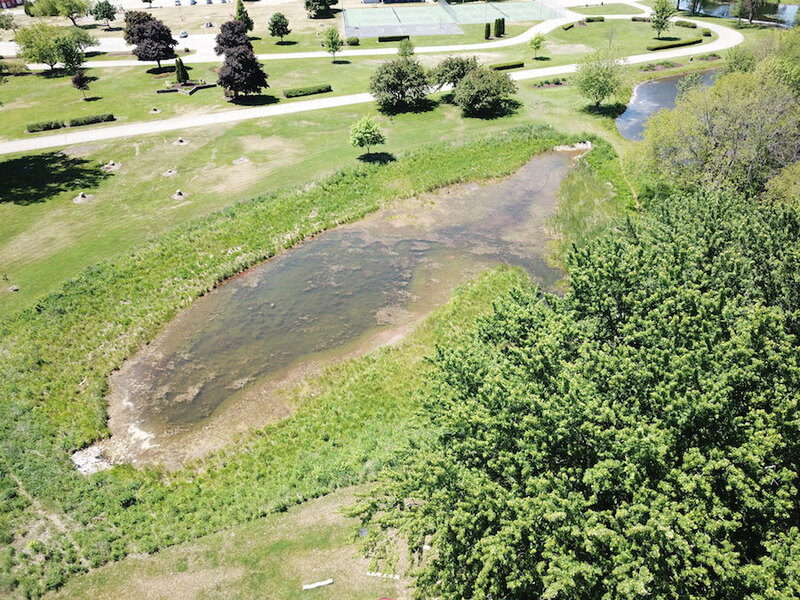 In the Second Phase of the project, Foth is recommending a channel be dug to connect the lake to the bay so dredging equipment can remove both soft and hard sediment to deepen the lake and improve the fish habitat in the lake. 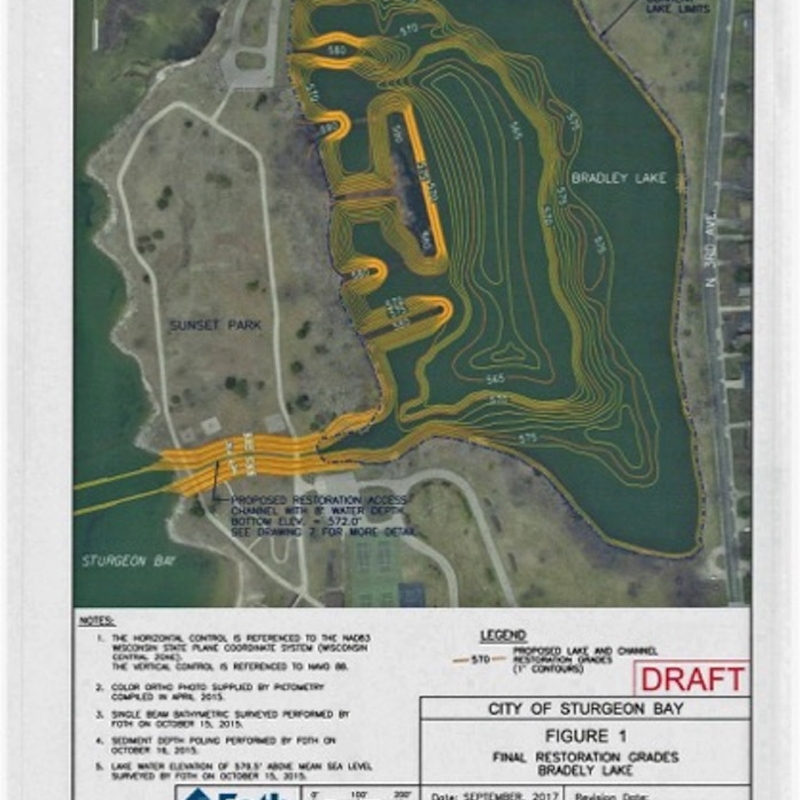 Barges would be loaded in the lake and material transported to property owned by Sturgeon Bay Utilities on Barge Road near the canal. 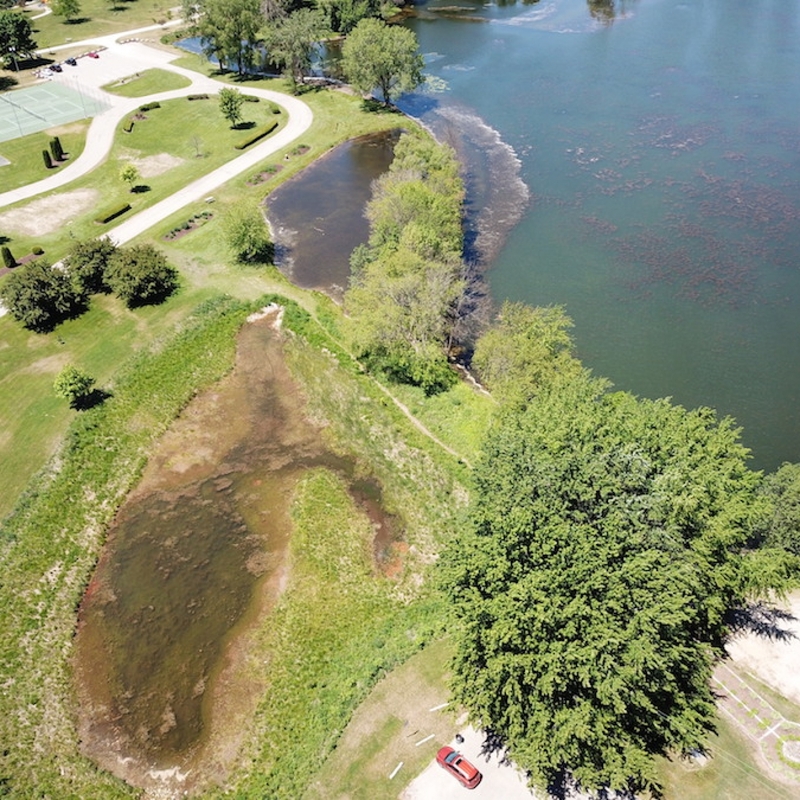 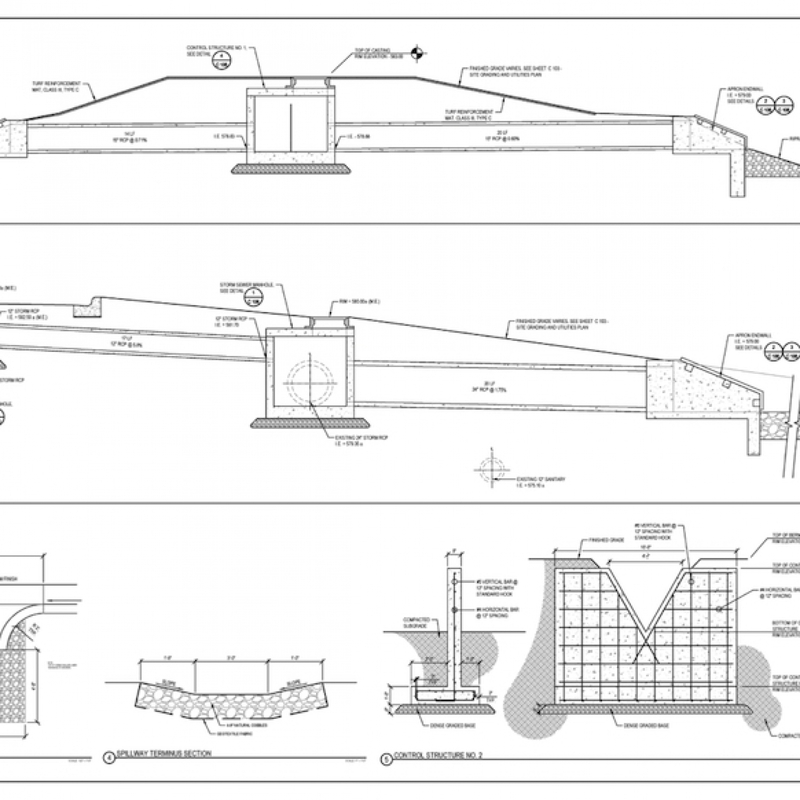 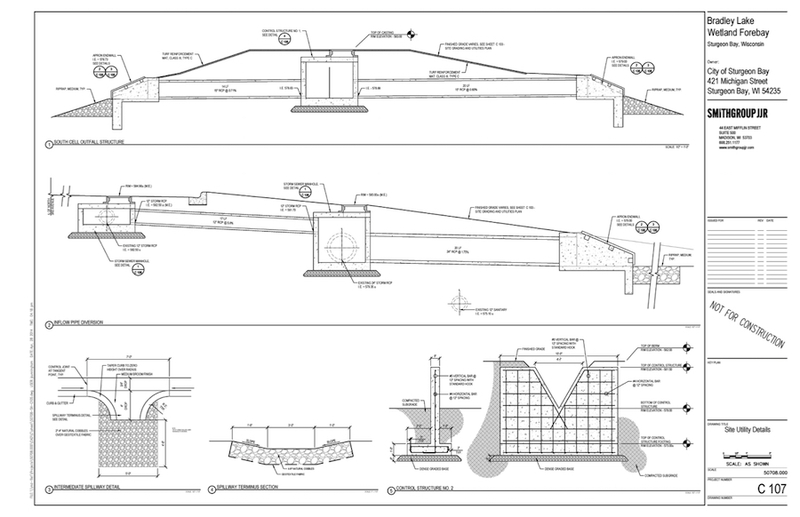 If the $3.5 to $4 million for this project cannot be raised, a less expensive alternative would be to use a suction dredge to just remove up to seven feet of soft sediment that covers some parts of the lake bottom. 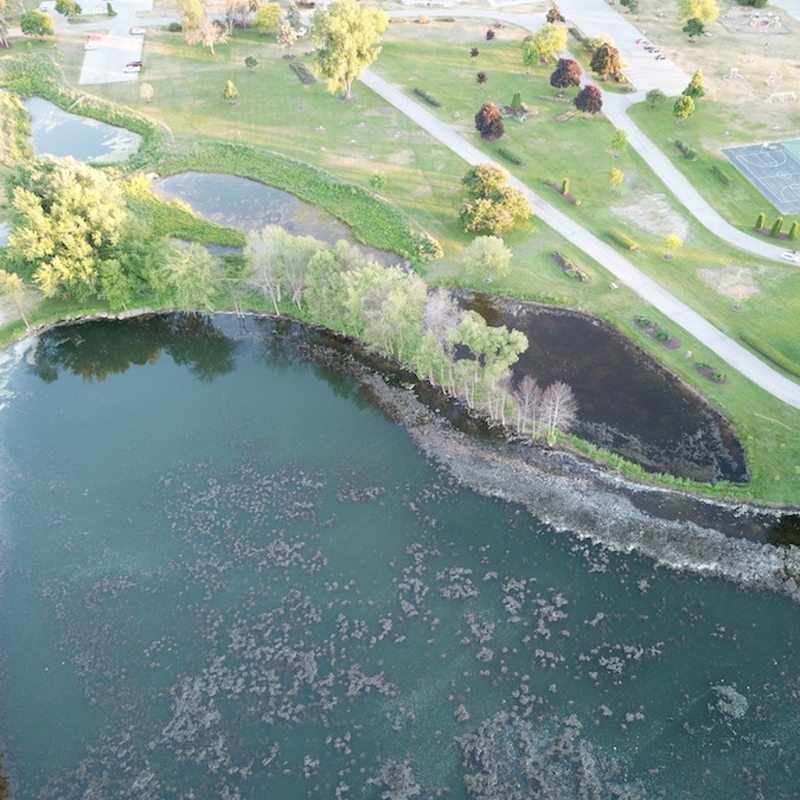 It was estimated that using a suction dredge to remove approximately 55,000 cubic yards of soft sediment would cost around $1.5 million. 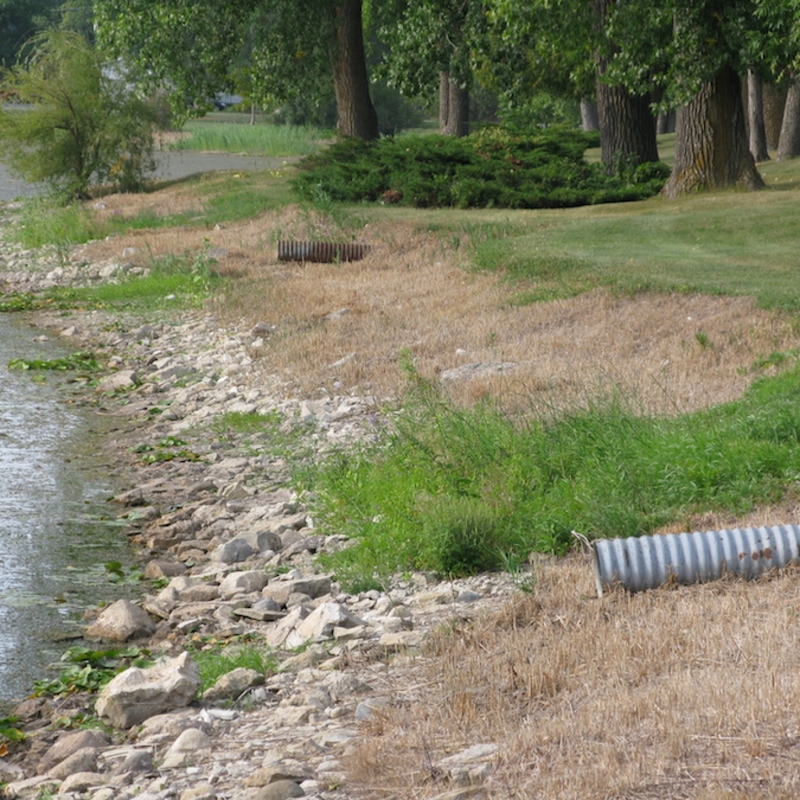 The amount of grant money available will determine if and how the lake will be dredged. 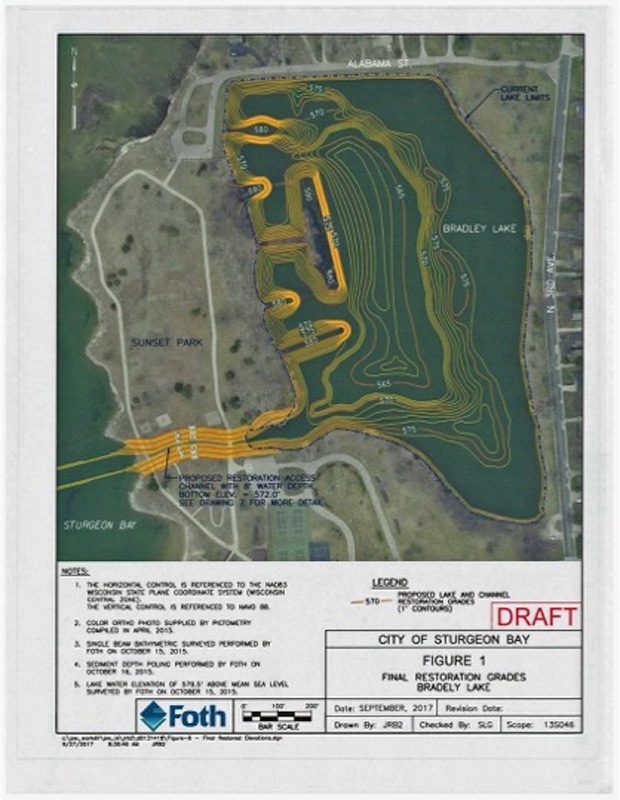 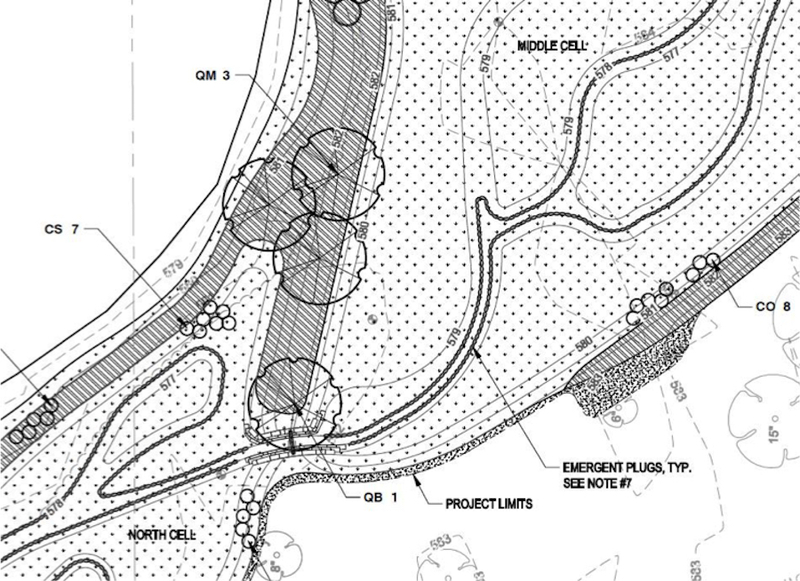 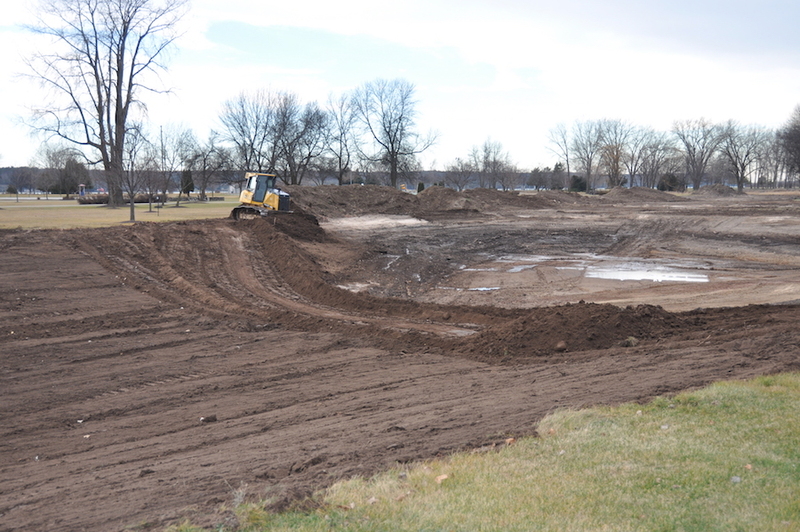 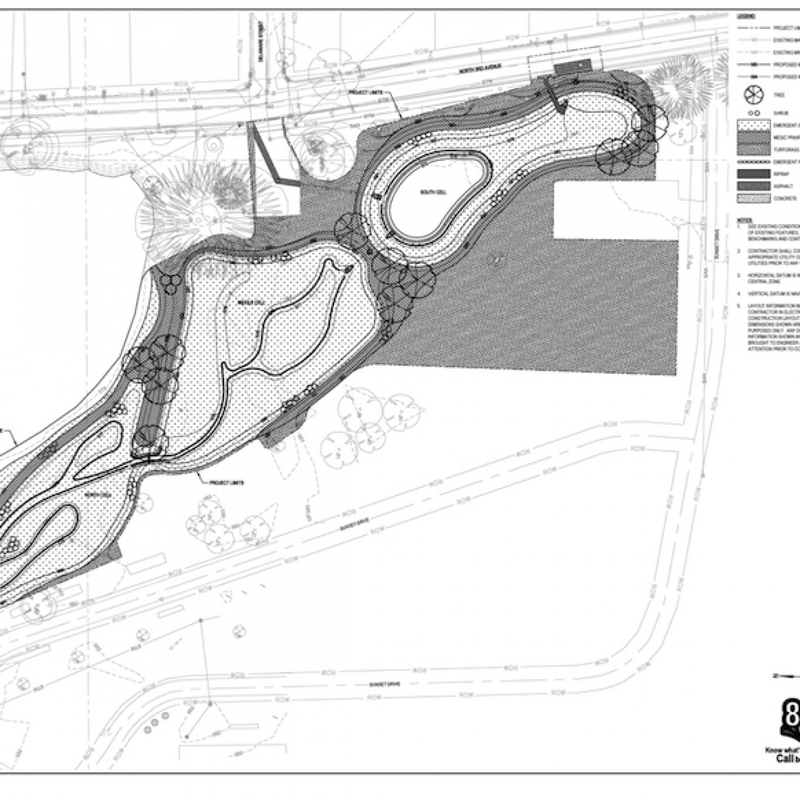 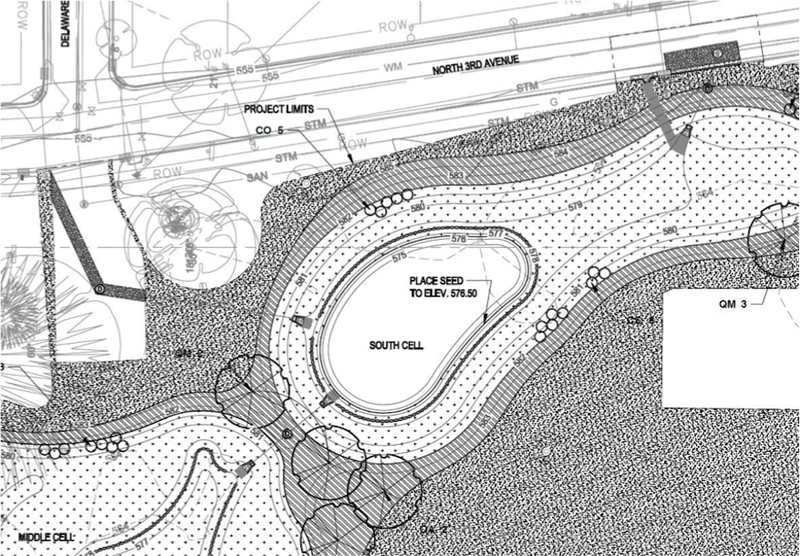 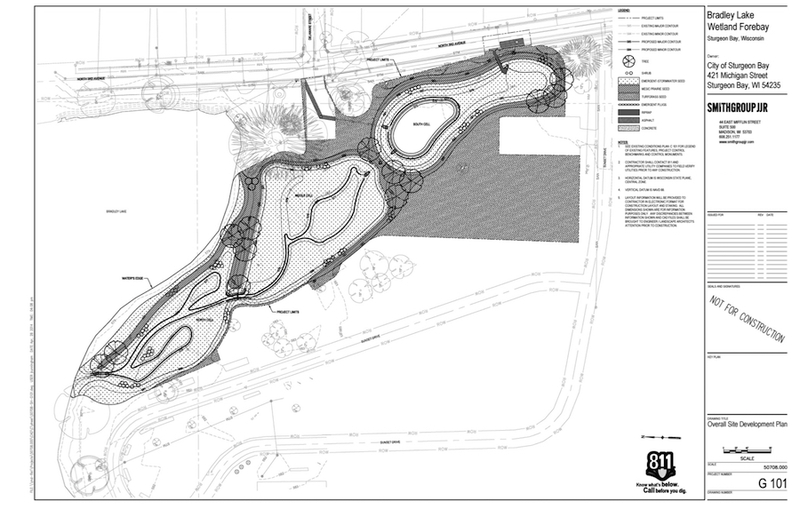 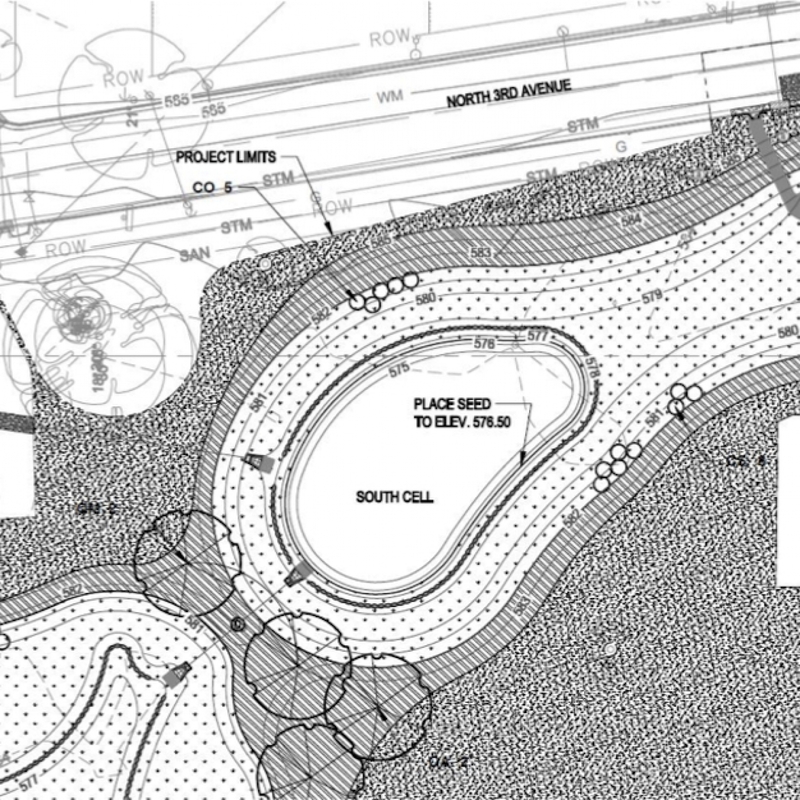 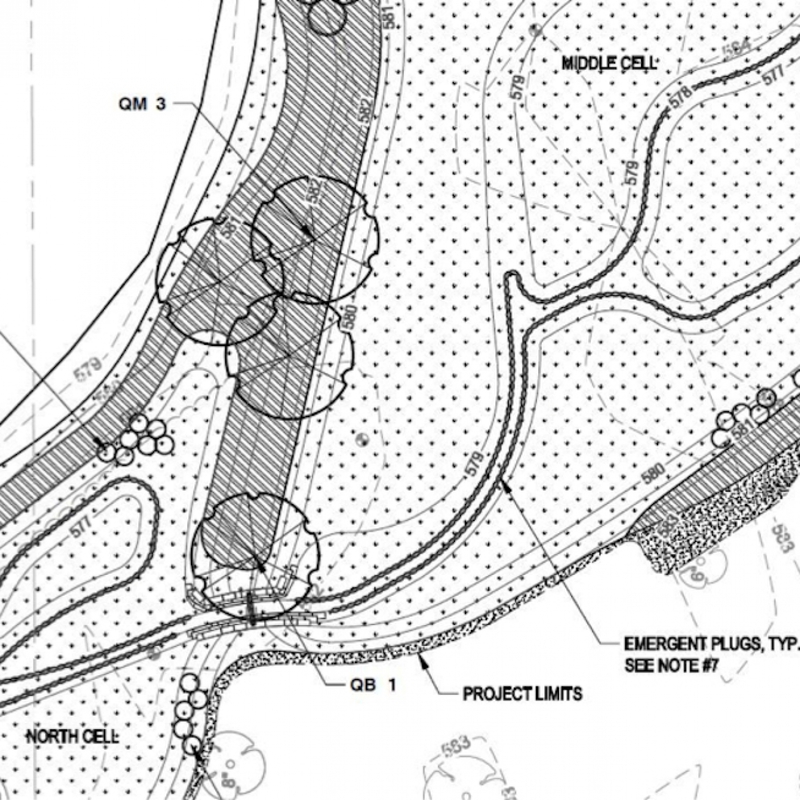 During the Third Phase of the Little Lake Restoration Project, improvements to the lake may include a launch area for canoes, kayaks, and paddle boats, a fishing pier, walking paths with informational kiosks explaining the wetland, and possibly an ice skating rink. 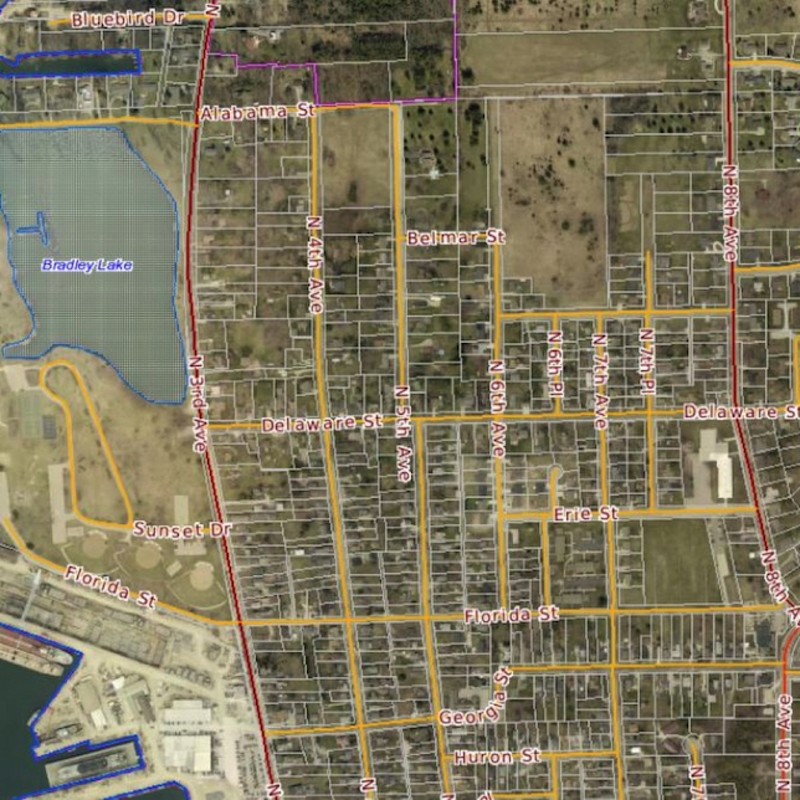 The city is also looking at future improvements to Sunset Park. 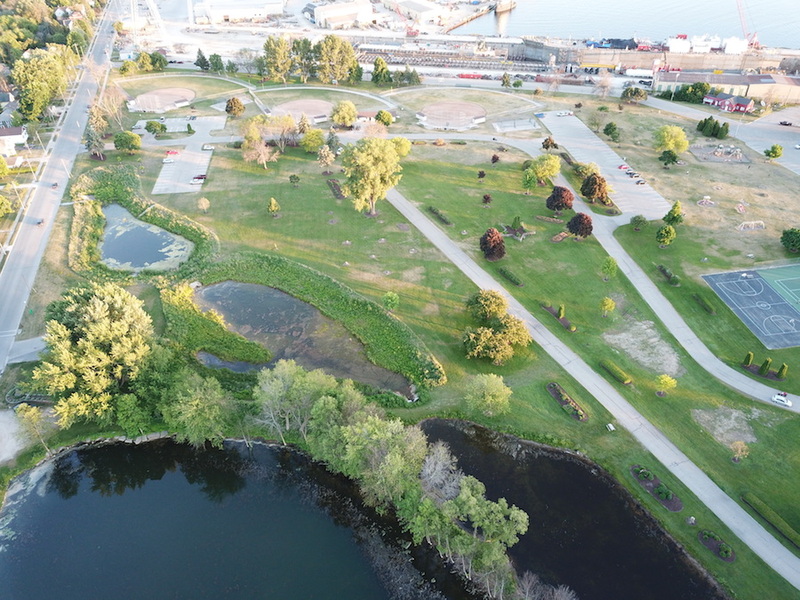 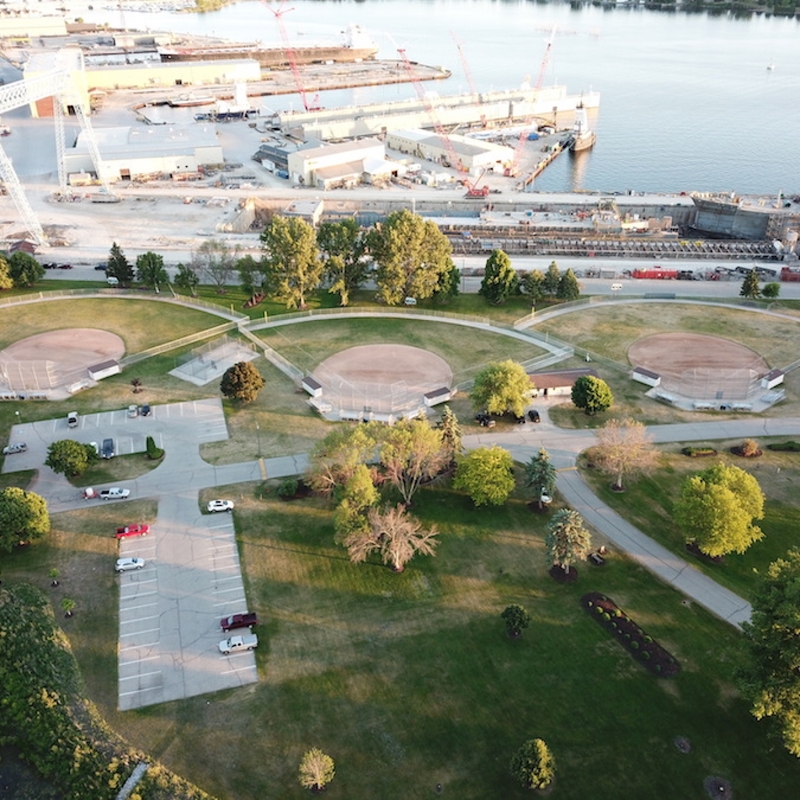 At meetings in the fall of 2017 and again in March of 2018, the city asked for input from the public to help decide what improvements should be made to the park. 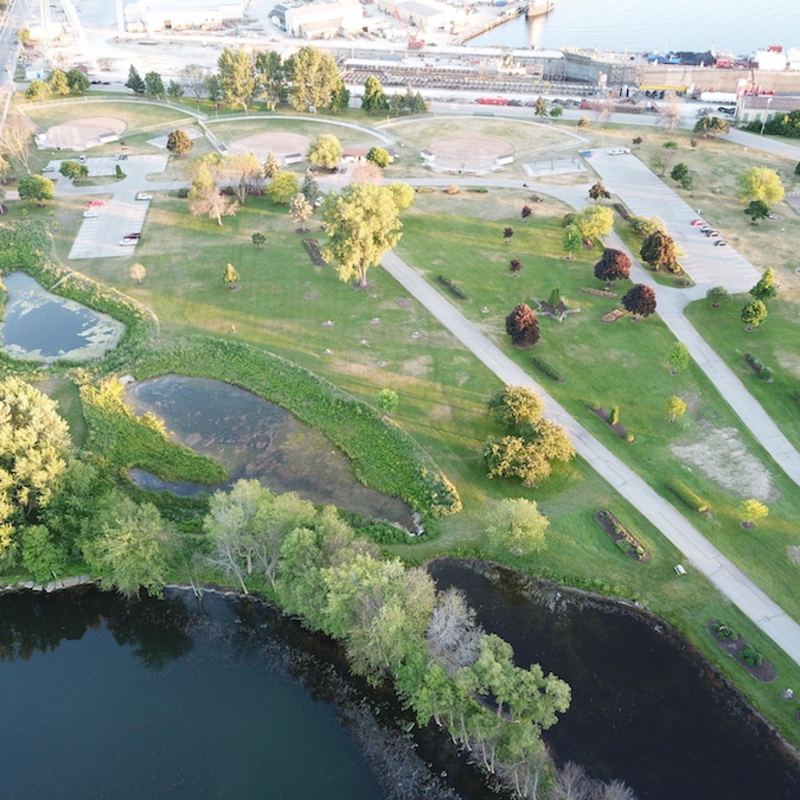 A complete upgrade to just Sunset Park could cost up to $5 million, but the project may have to be scaled back depending on the amount of grant money available. 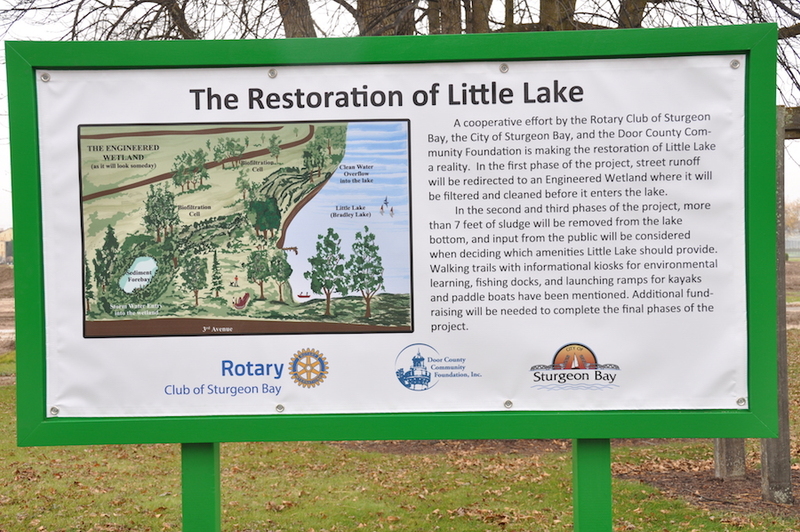 We feel the Restoration of Little Lake is a very worthwhile project for our Rotary Club. 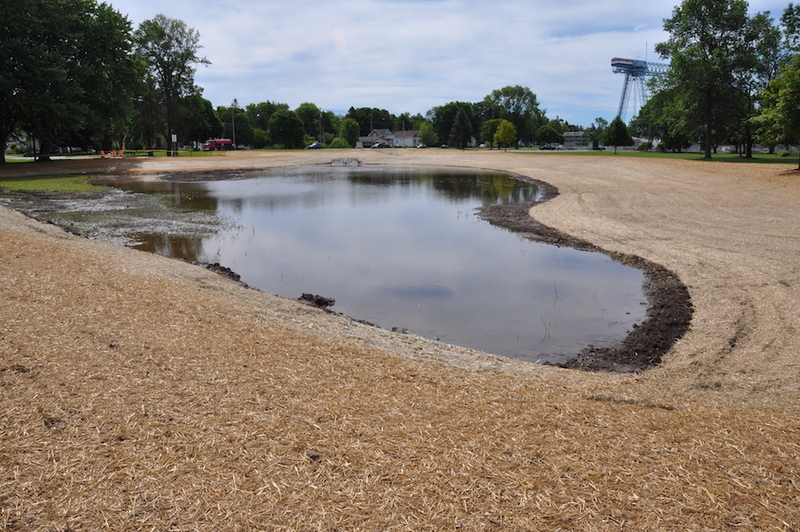 Someday we hope to add a chapter to Dr. Herlache’s “History of Little Lake” covering the restoration of the lake. 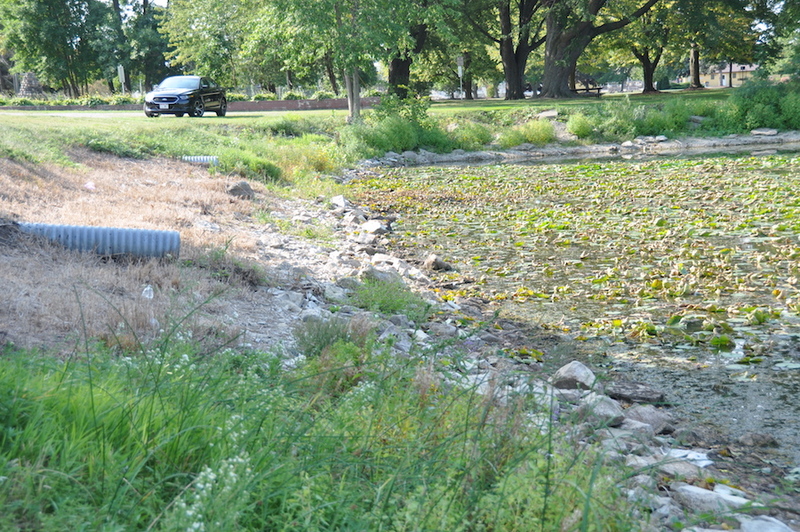 Greg has selected pictures that help explain the restoration project. 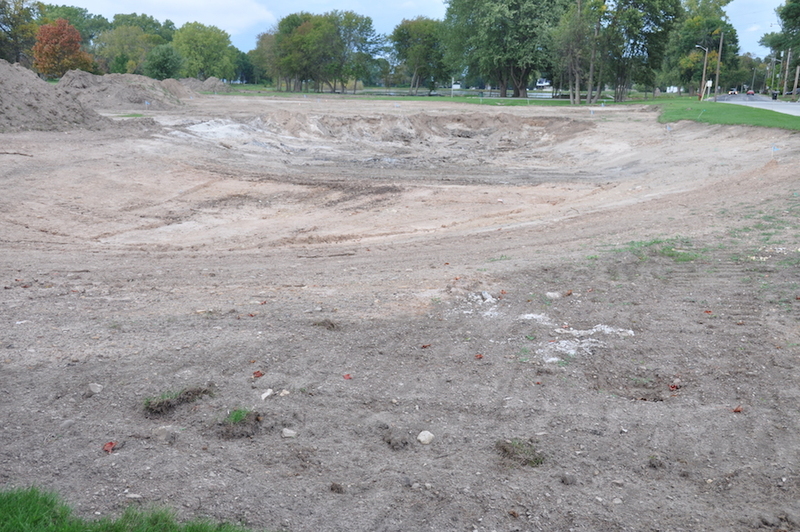 These pictures are included on this website and show the First Phase of the project. 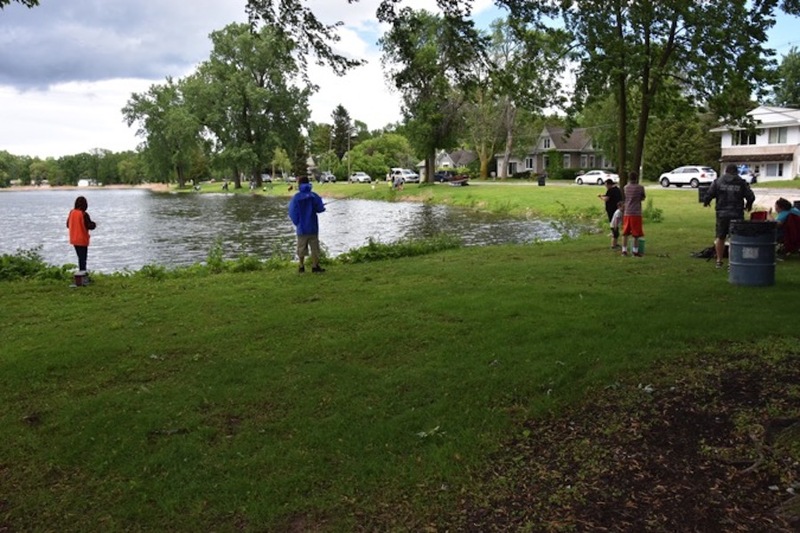 Click on the first image to expand the photography gallery.